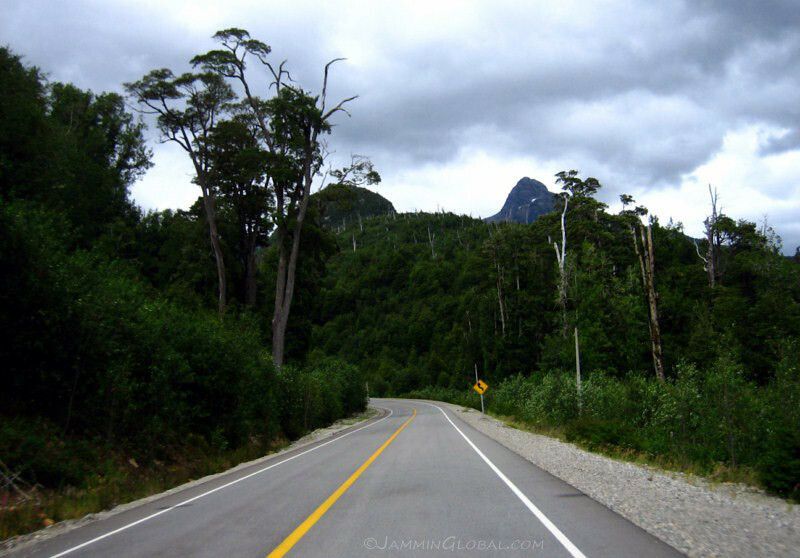 Winding through the wet and verdant side of Patagonia is the Carretera Austral, a famed, remote route linking the towns in Chile’s Northern Patagonia. 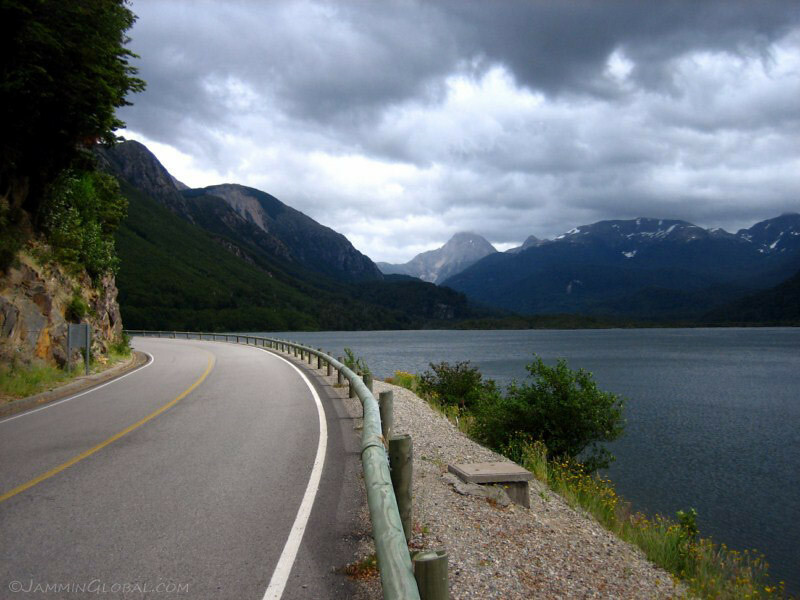 It’s one of the great destination roads in the world, renowned for its lush forests and numerous glaciated lakes. 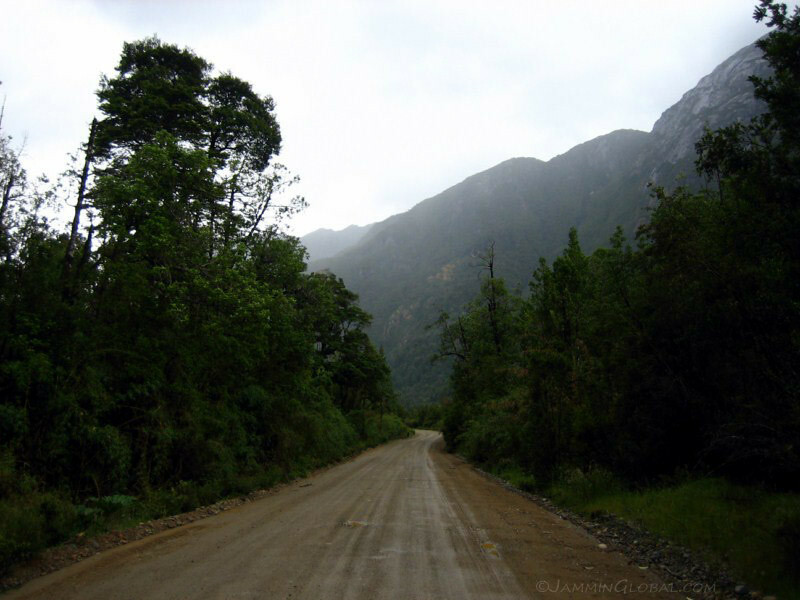 Being cut off from direct road access to the rest of Chile keeps this region isolated and charming. 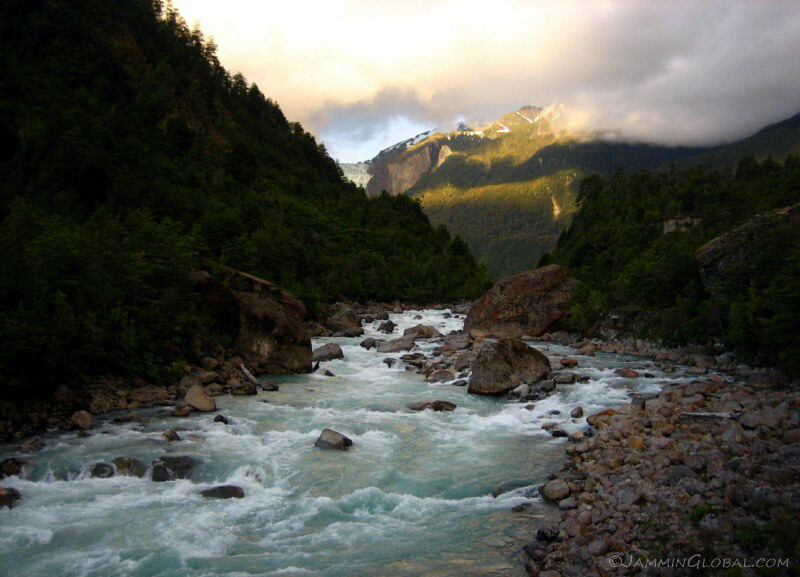 In southern Chile, the Andes spill into the Pacific and thus in many places, water becomes the only means of connection to the rest of the country. 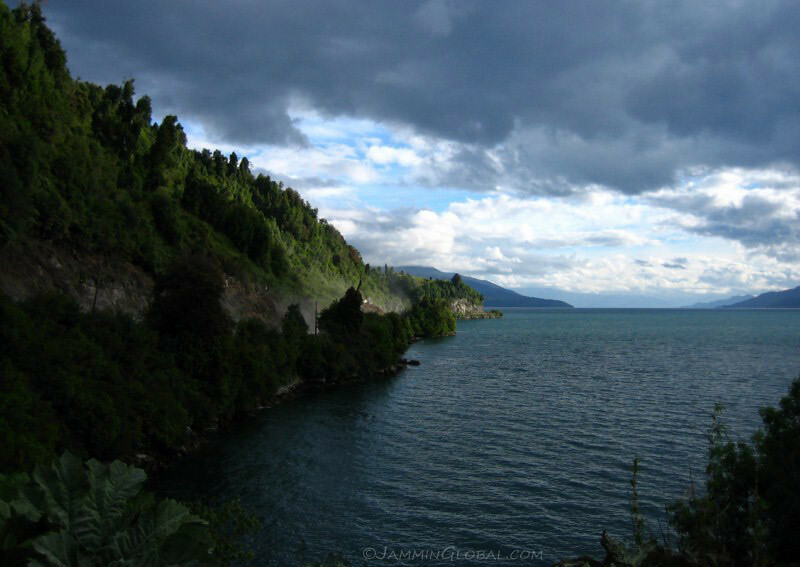 There’s a ferry service from Puerto Montt, the last city in contiguous Chile to the small town of Chaitén (which was destroyed by its volcano in 2008), where the Carretera Austral currently begins. Small isolated communities existed here, long before any connections via land, as they were sea-fairing peoples. 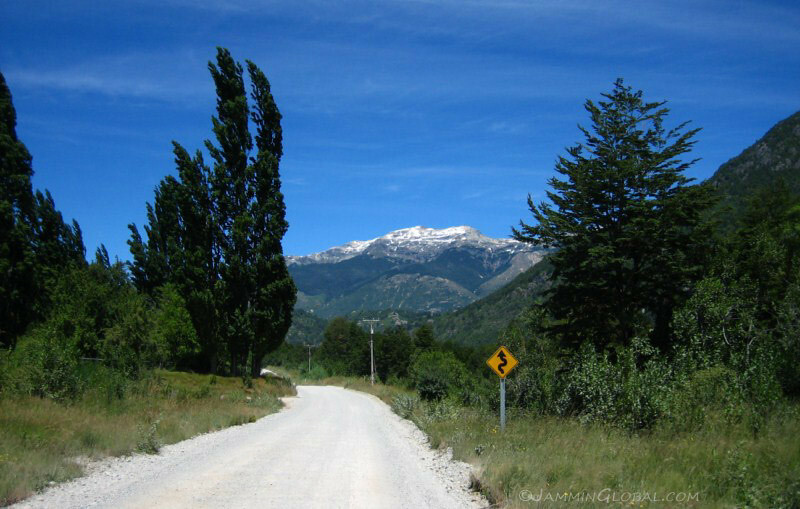 During Chile’s last military dictatorship, General Augusto Pinochet decided to forge a road through the wilderness in order to better integrate these isolated communities with the rest of Chile. 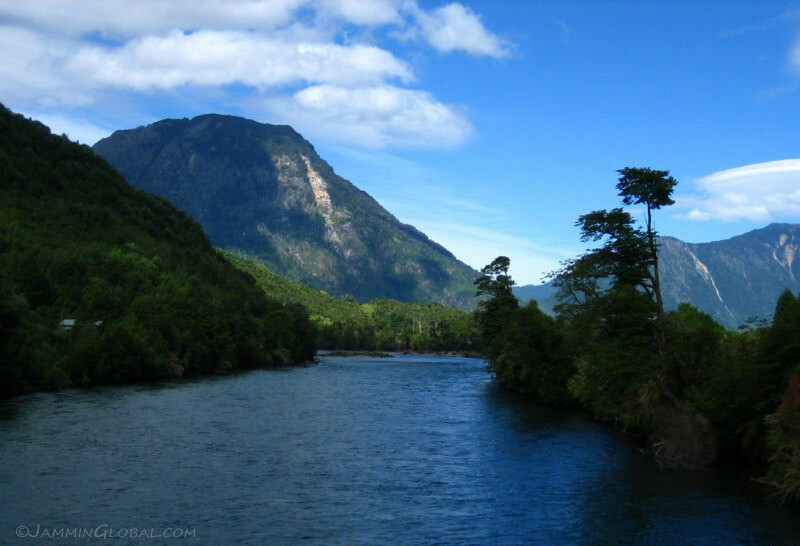 The project hasn’t been completed yet, so land access only comes from crossing over from Argentina. 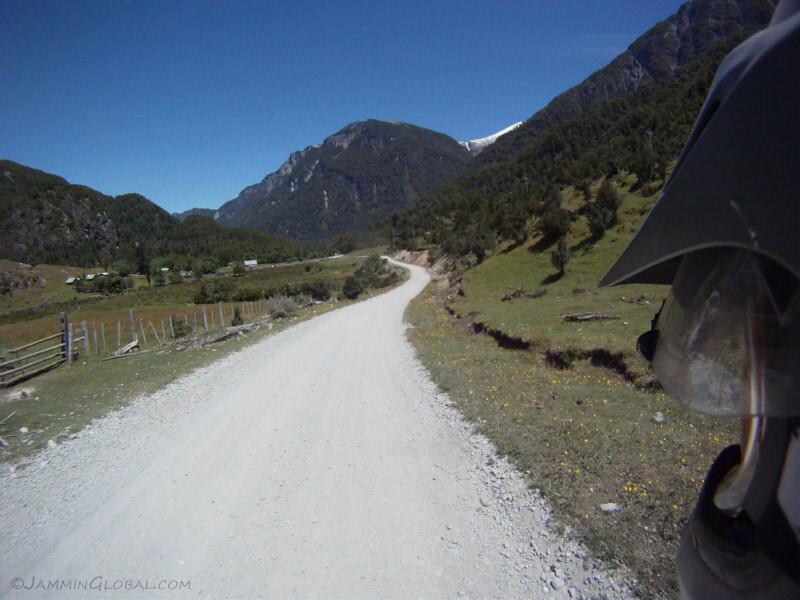 Being remote and rural, most of the road is unpaved and enjoyable. However, as no place on this planet can escape modernisation, large sections of the route around big cities have been paved over. I took my time and visited small fishing communities along the route and enjoyed the ability to wild camp in beautiful places. 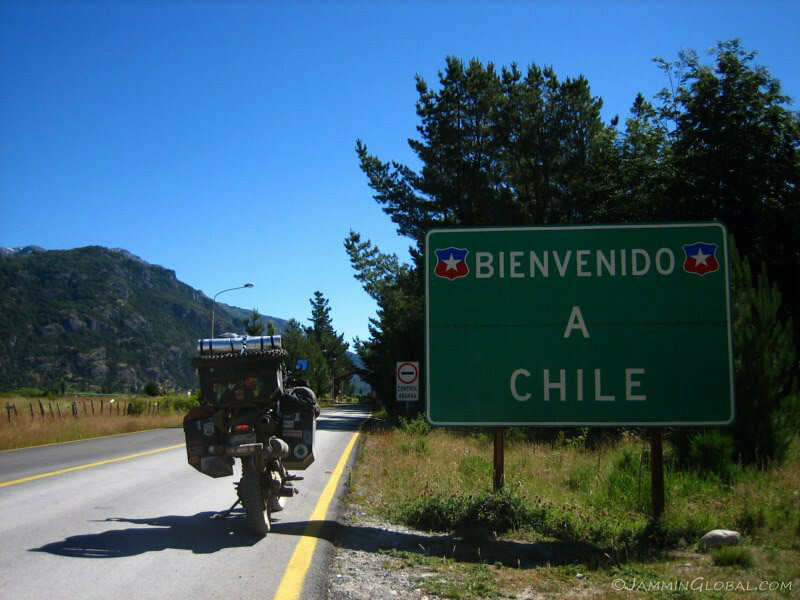 A massive welcome sign into Chile at the border crossing near Futalefú. The two countries like to show up each other and I get the feeling, Chile wants to show-off its superior development. 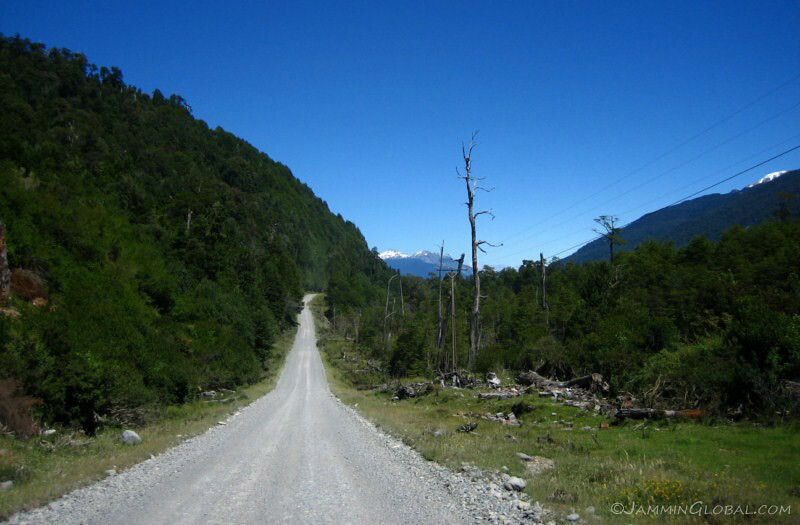 My route along the Carretera Austral. Click on it to go to the interactive version in Google Maps. 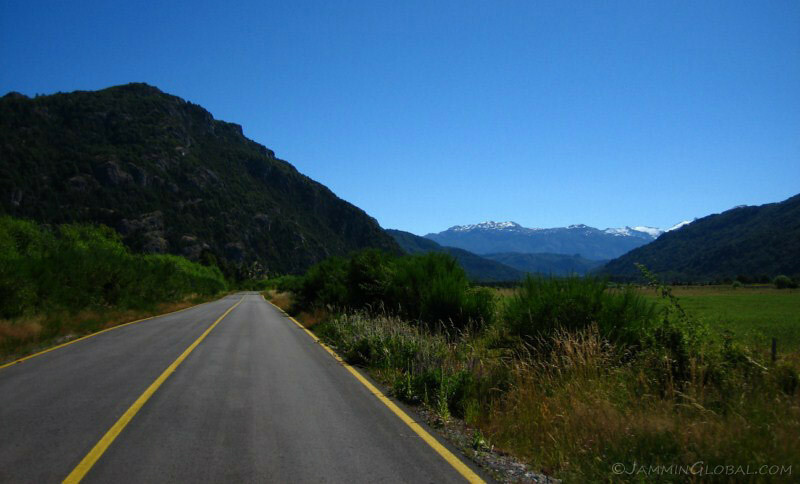 The road is paved the 10 kms (6 mi) from the border to the town of Futalefú, which has survived through the years from its land border connection with Argentina, as it is not connected by roads to the rest of northern Chile. 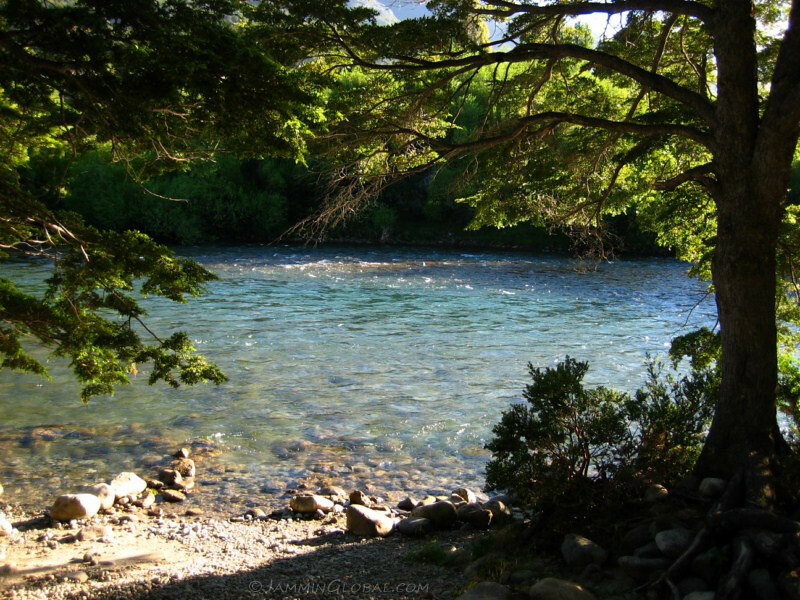 At a campsite on Rio Futalefú, just outside town that cost 3000 Chilean Pesos for the night, equal to US$6.50. Fire! 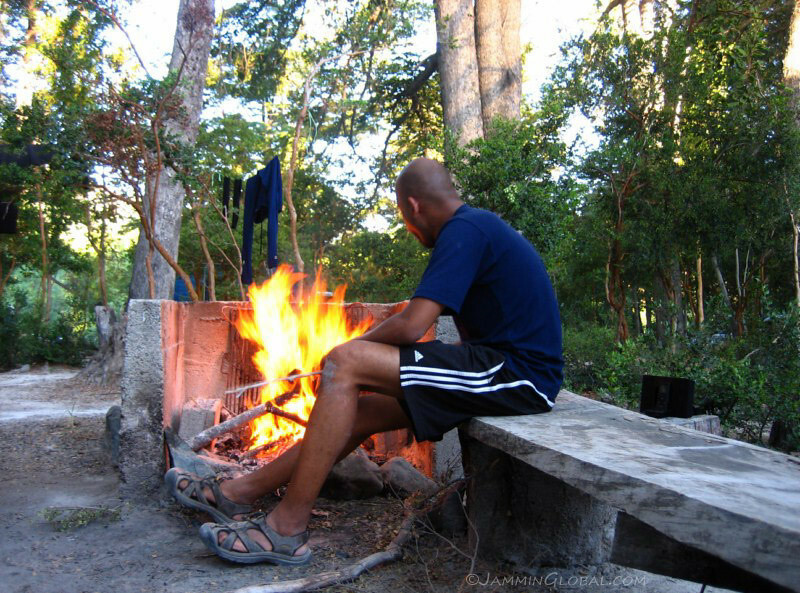 Getting a fire going with wood supplied by the camp owner. It’s the height of the southern summer and the sun is setting later into the evening the further south I go. It’s around 8:30 pm now and while it feels strange to have a fire when it’s light out, I needed to get to sleep for an early start. Setting up my kitchen, which has grown to include oil, soy sauce, garlic sauce and coffee powder. And that little spice jar on the right is Smoked Curry powder that I found in Bariloche. Just like in Alaska, they like to smoke fish and meats down here and I was beaming to find curry powder infused with the aromas of traditional smoking. 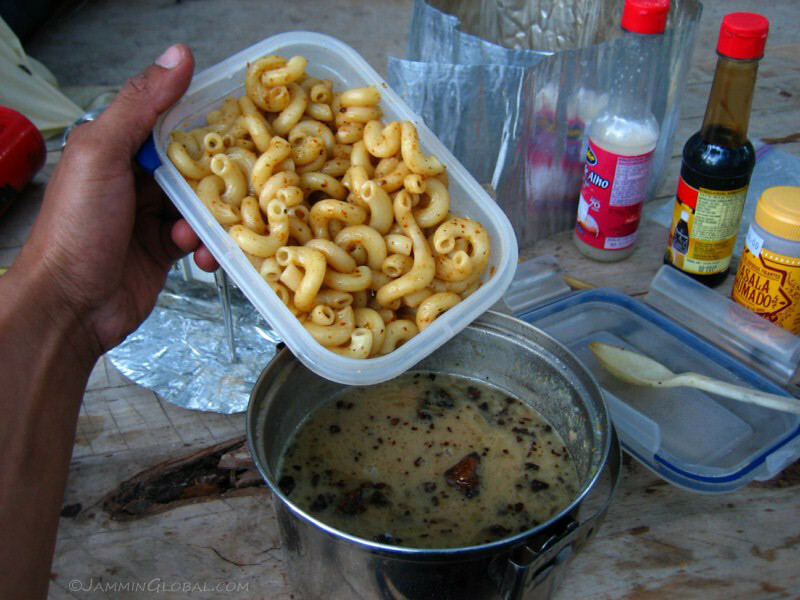 A simple meal of pasta going into a soup from bouillon cubes with a can of beef liver pate stirred in. It might make some people squirm, but hey, it’s cheap protein, so throw some spices on it and refuel the body. 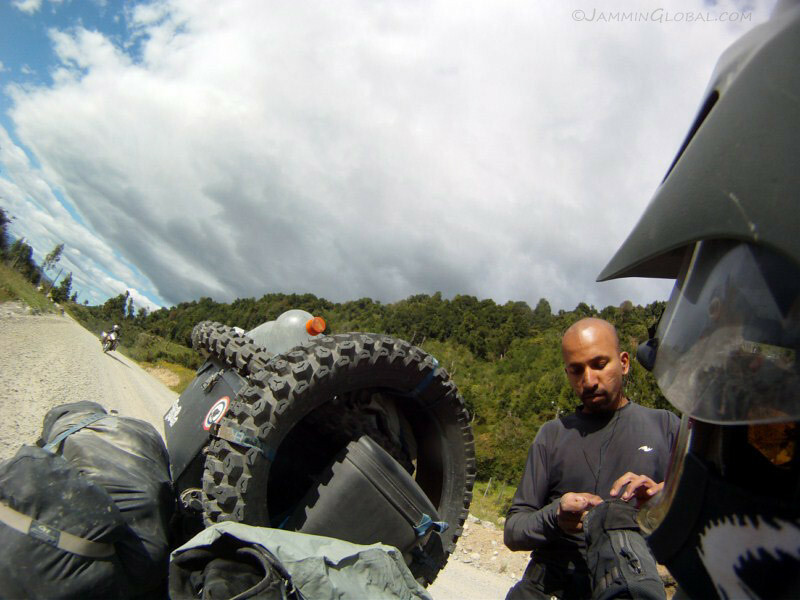 In the morning, as I was packing up, I met James, who was getting ready to guide a raft down Rio Futalefú. He’s a rafting guide from the US, who came down for the Chilean summer with his current outfit to guide a group of American adventurers. He said this river is an excellent one for rafting and gets to the Pacific in about 60 kms (38 mi). 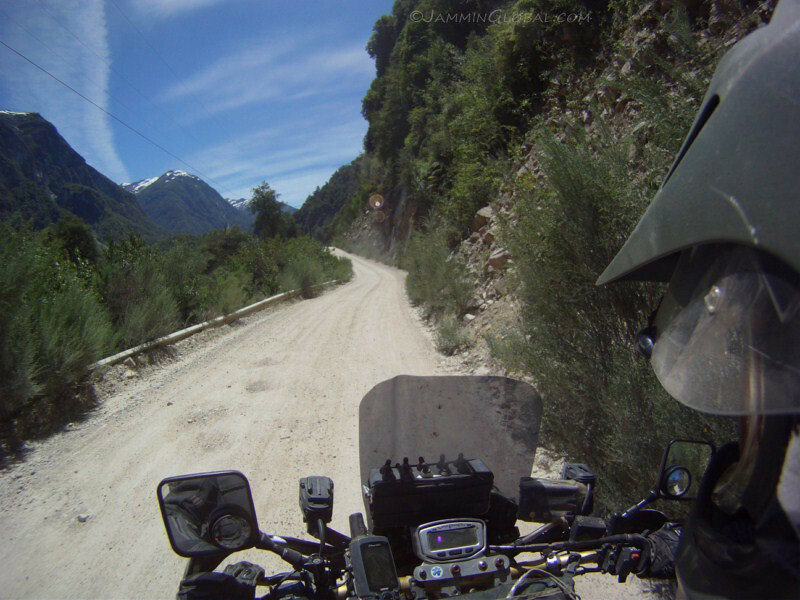 Setting off from Futalefú to catch the Carretera Austral. 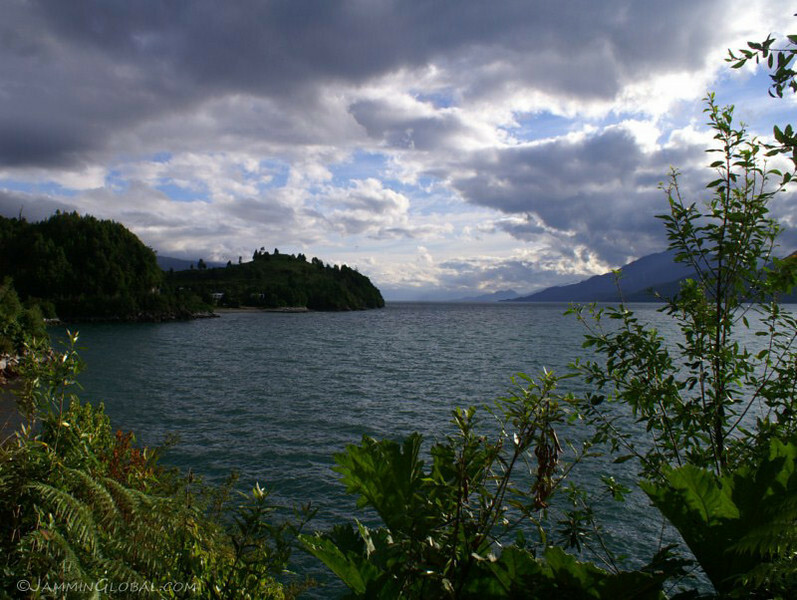 A taste of the numerous lakes and the views to come all along Chile’s Northern Patagonia region. 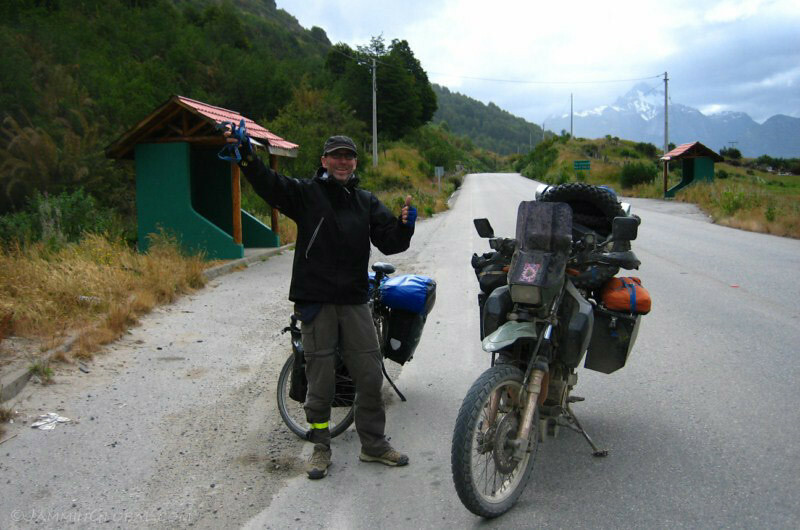 It was 75 kms (47 mi) to the junction of the Carretera Austral. However, the ride there on this spur was interesting in its own right. Crossing Rio Futalefú as it flows to the ocean. I was happy to be in a place where blue lakes and snow-capped mountains are the common sight. It might get tiring after the first few, but this was candy for my eyes. 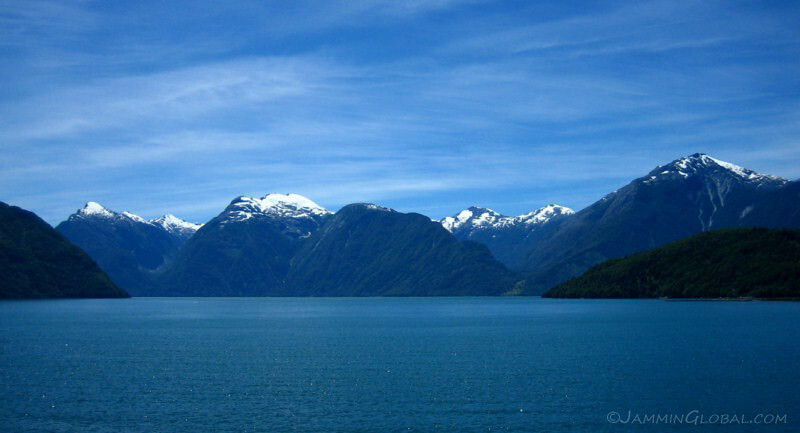 This whole area of southern Chile was under the Patagonia Ice Sheet during the last ice age, which ended here about 17,500 years ago and all these lakes are what’s left of the ice sheet along with two huge ice fields up in the mountains, which drive the local climate. They say the melting of this ice sheet alone raised global sea levels by 1.2 meters and it’s been predicted that if we reach a tipping point in the current warming of the planet that triggers the Greenland Ice Sheet to melt, sea level will rise by 7 m (23 ft) in just one century. I wonder if all our coastal cities can cope with that kind of rapid geologic change. 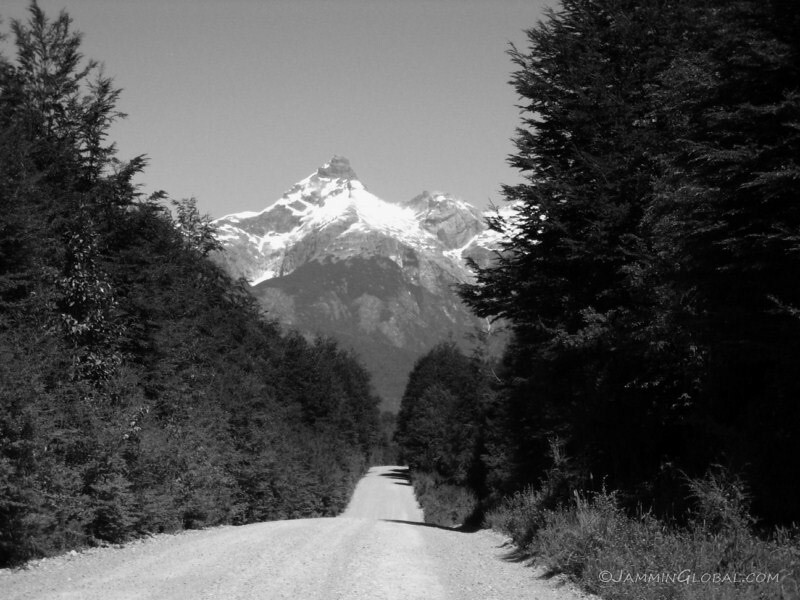 On the Carretera Austral (CH-7) and it starts to impress right away. 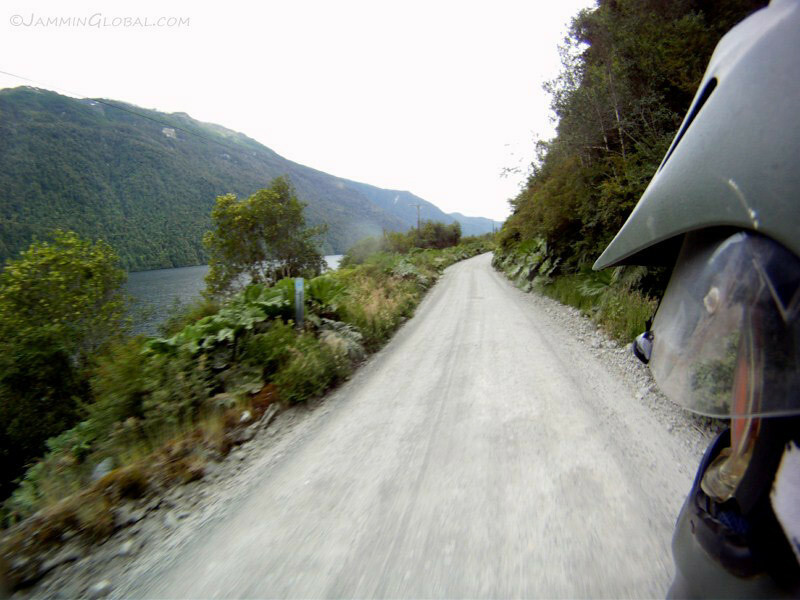 This is one of the great destination roads in the world, famed for its remoteness and unending natural beauty. 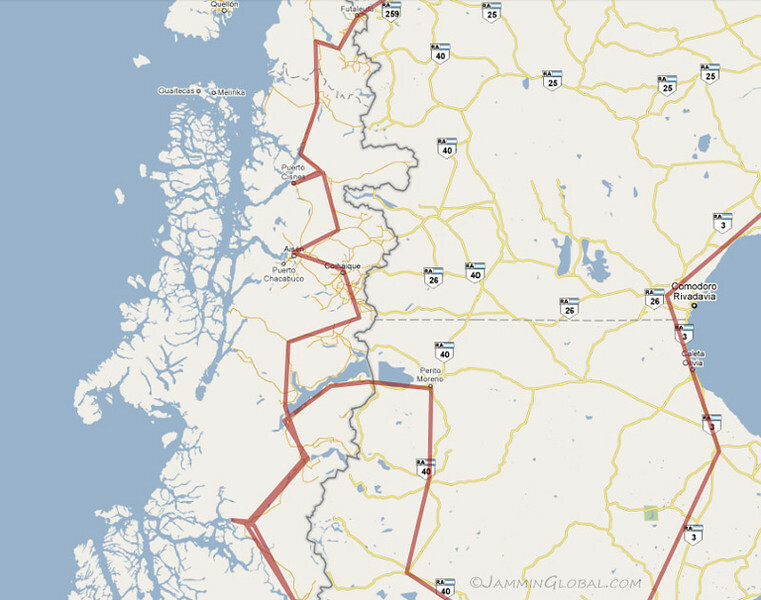 The route technically starts in Puerto Montt, but the road south of there from Hornopirén to Chaitén is still under construction and is traversed by irregular ferries. 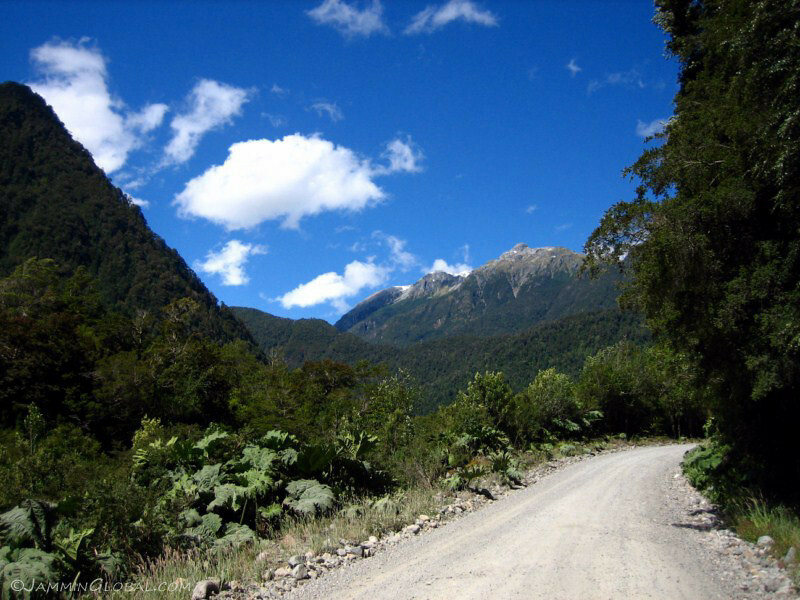 So, the overland route is best accessed from Futalefú. 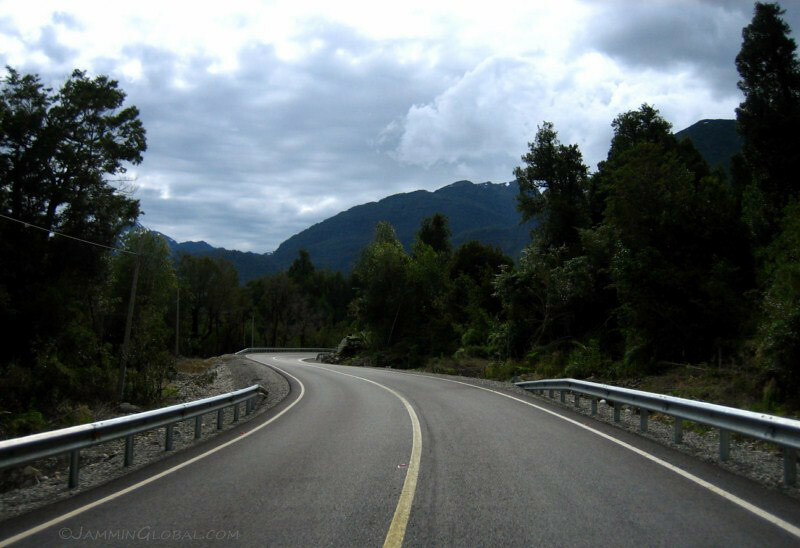 The road has many different characteristics and in the upper parts, it’s long and straight with great views of snow-capped mountains to cross further south. Pretty soon into the ride, it’s hard to avoid the local controversy going on here. 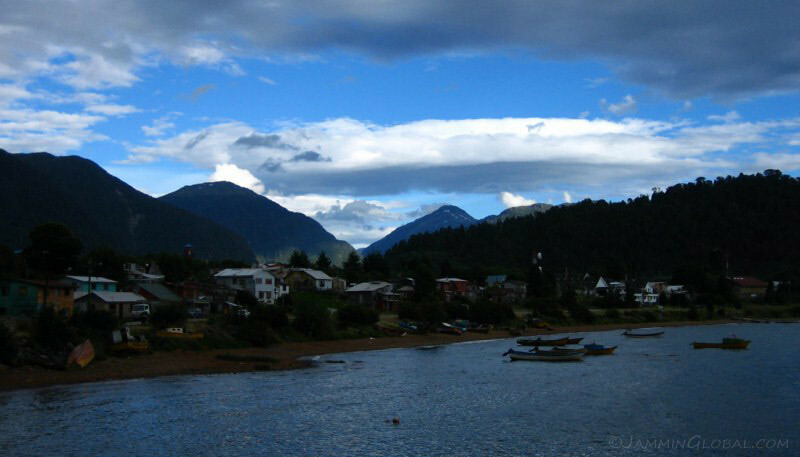 The Chilean government wants to build dams for hydroelectric power all through Patagonia and it’s contracted the Spanish company HydroAysen to figure out how to do it. 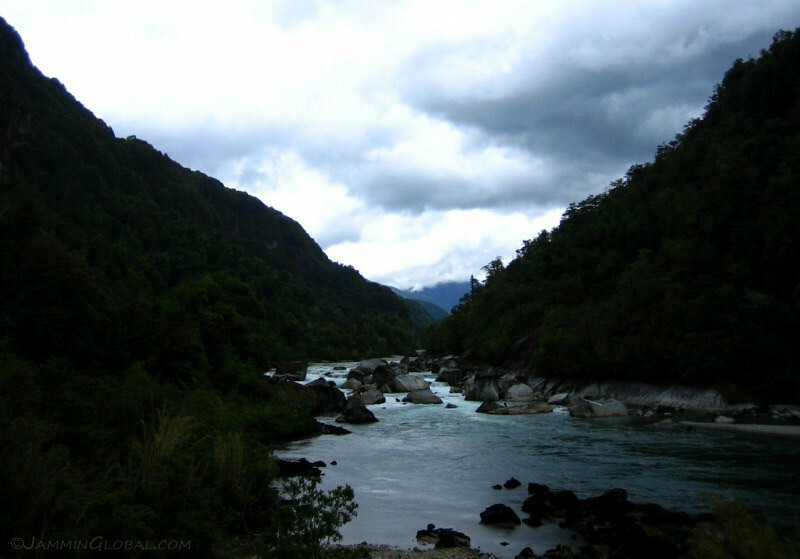 However, the locals are fiercely against it, along with international environmental groups and it’s an on-going situation. 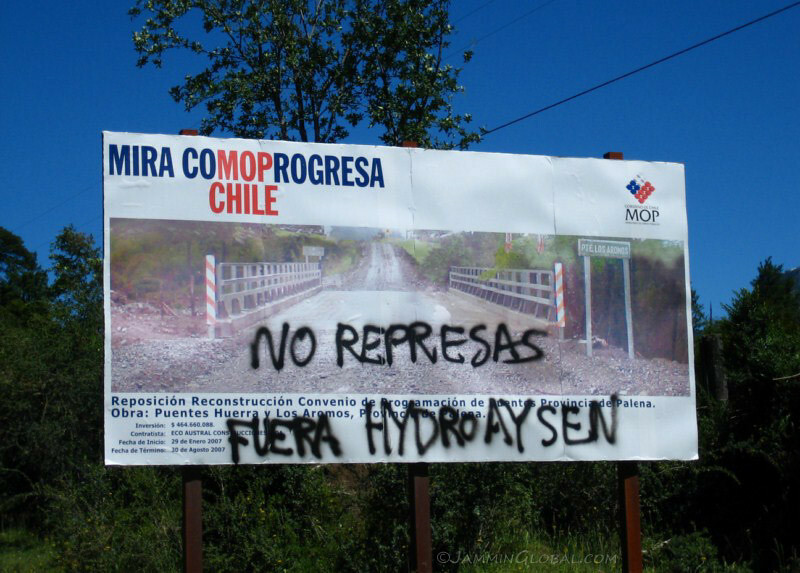 ‘No represas, Fuera HydroAysen’ = No Dams, Get out HydroAysen. Another point is these billboards, which can be found in remote places where some form of modern infrastructure project has just been completed by the government. I guess the people here have felt isolated and ignored by the rest of Chile for a long time and now the government is working hard to show them that it’s bringing progress to the region in terms of bridges and paving. It was amusing for me to see a brand new concrete intersection in the middle of nowhere and then a huge billboard with the photo of said intersection and the message, “Look at how we’re progressing Chile” (by the ministry of public works). 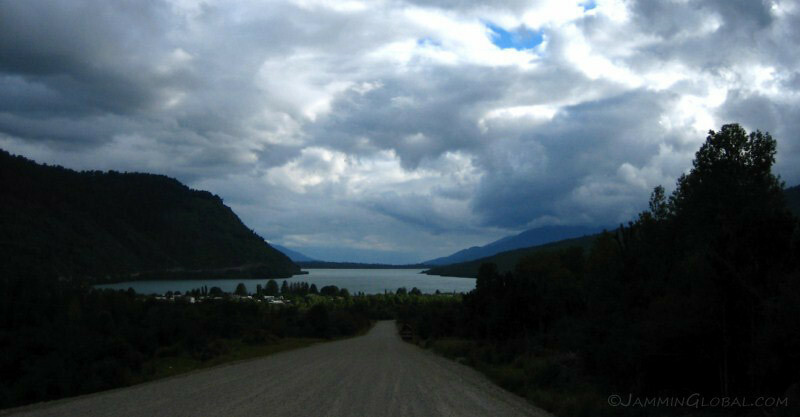 The Carretera Austral was built during the 1980’s by the Chilean Army’s Engineering Command and it is only since 1988 that travellers have been coming through here on their own vehicles. 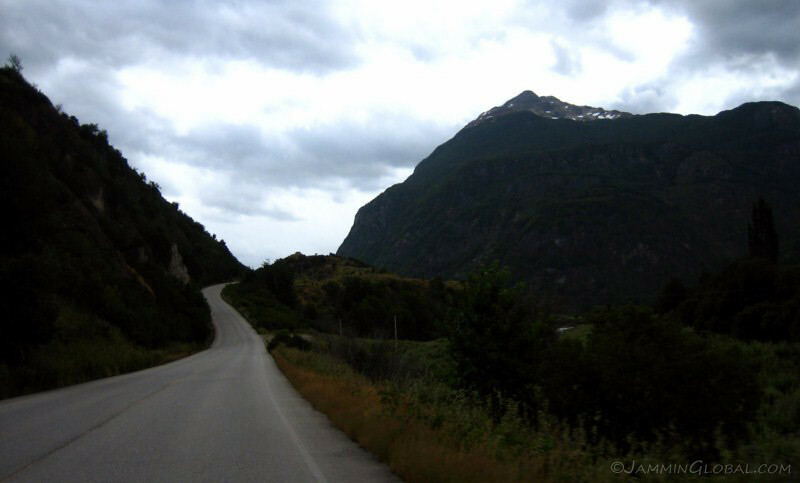 Previously, visitors and locals had to come via sea and the numerous fjords that define the land-sea border here. 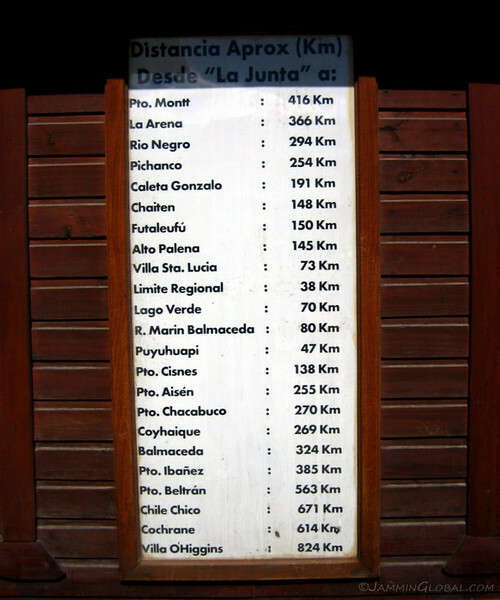 A distance board indicating all the major towns along the route. 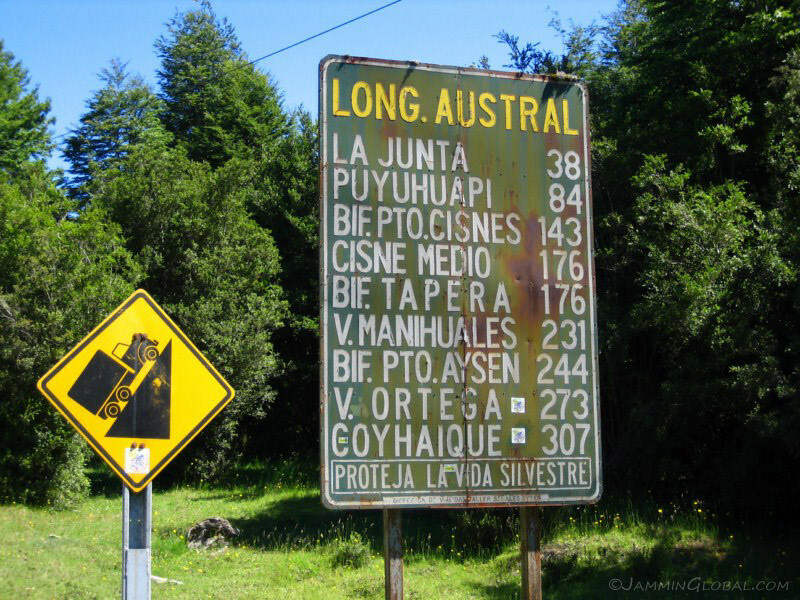 The official name of the highway is Longitudinal Austral (southern longitudinal route). They sure do exaggerate the steepness of the grade here and the interesting thing was to note all the different forms of vehicles used for the road grade signs; it changes almost with every sign. 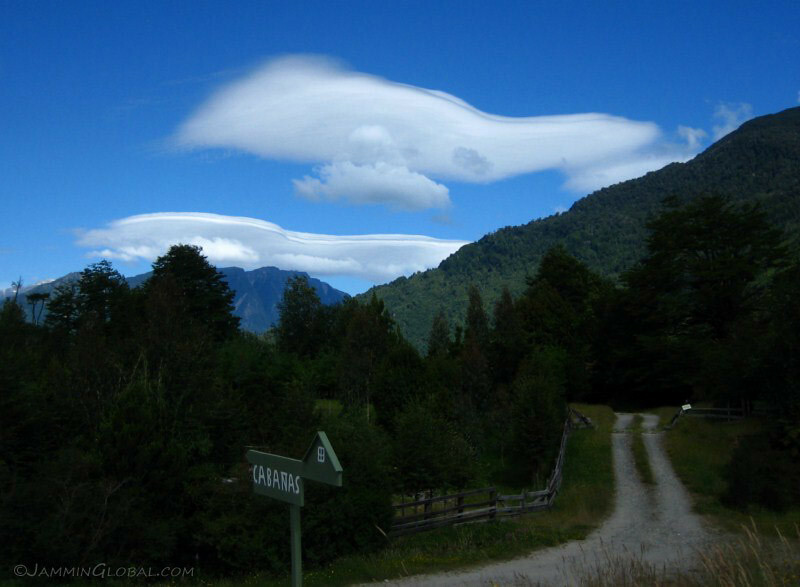 Lenticular or wave clouds, sculpted by the fierce winds of Patagonia, which were less intense on this side (compared to Argentina), but they were always blowing. These clouds form on the crest of waves when moist air flows over mountains. Their lens-like shape has been mistaken for UFOs in better formed specimens. 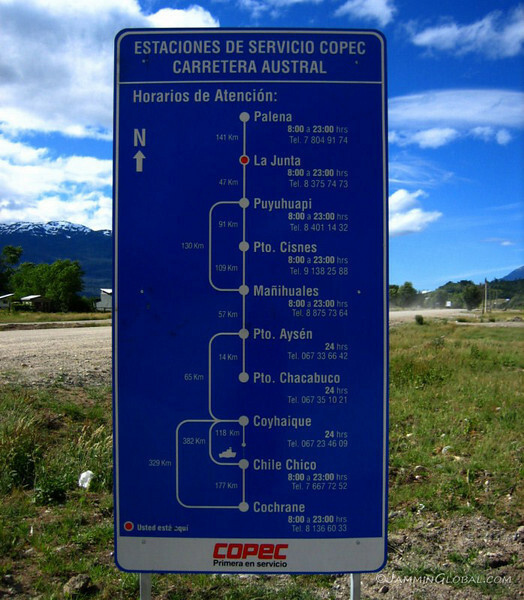 La Junta and the famous sign of the highway, bearing the name of General Augusto Pinochet, the previous name of the highway. It looks like this fence around the sign is quite new as previous travellers have been able to get right under the sign. There’s a gas station across the sign and a detailed distance board of all the communities north and south of La Junta. 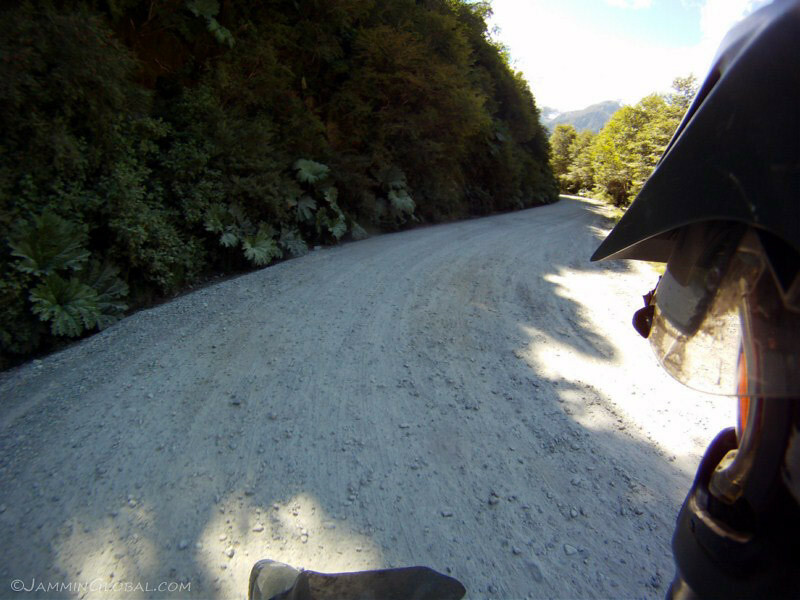 I was heading all the way to the end at Villa O’Higgins, 824 kms (512 mi) away. Villa Santa Lucia is the town at the junction to the road coming from Futalefú. Copec is the national oil company and they’ve got the route pretty well covered. 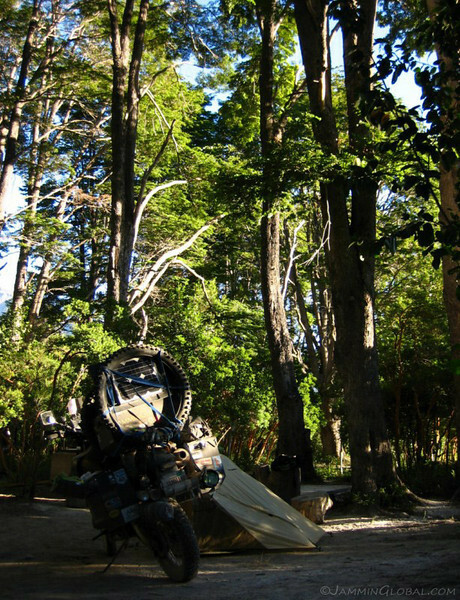 Cochrane is the last place with a proper petrol station, but it can still be found in Villa O’Higgins. Being remote, especially via land, petrol prices here are higher than the rest of Chile, which is already pretty steep. The cheapest was in the biggest city of Coyhaique at CP736/L ($6.04/gal) and the most expensive in Villa O’Higgins at CP935/L ($7.68/gal). 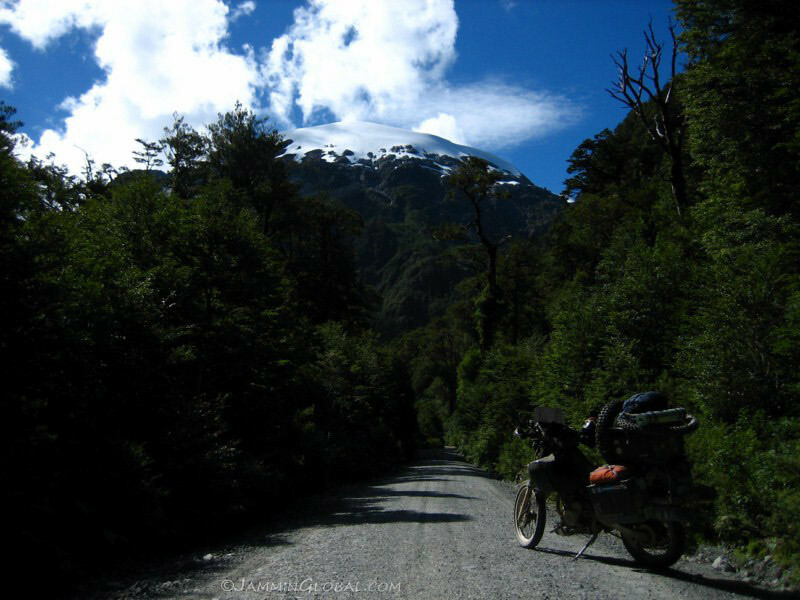 I was planning to spend the night near La Junta, but a couple, traveling on a new Honda TransAlp from Santiago approached me and told me about this hanging glacier that we could camp at a bit further south. Sounds good to me. Putting in my wind-stop liner as the temps dropped with the receding sun and the TransAlp couple, Francisco and Liz swinging by. It was their first time going off-road and I made their ride a lot more comfortable by lowering the air pressure in their tires. 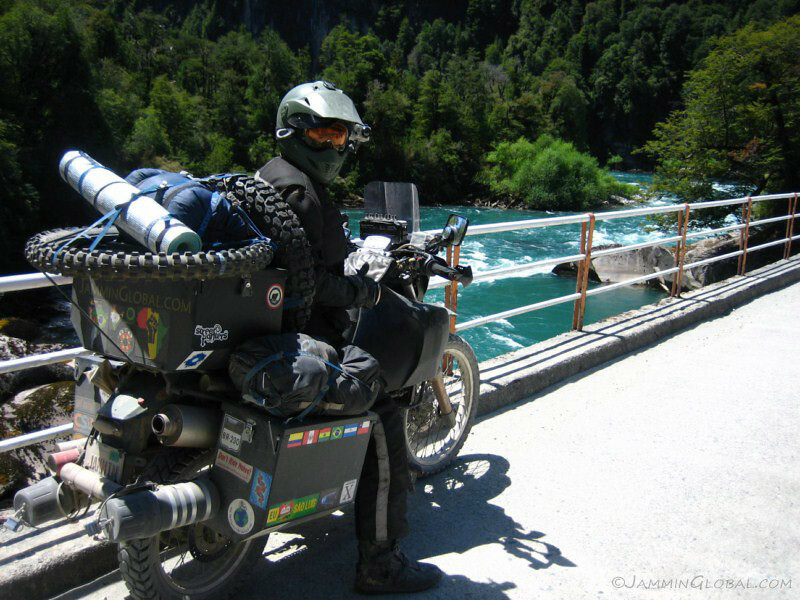 They had just gotten into motorcycling recently and wanted to practice and learn how to tour by motorcycle before setting off on their dream ride all the way up to Alaska. 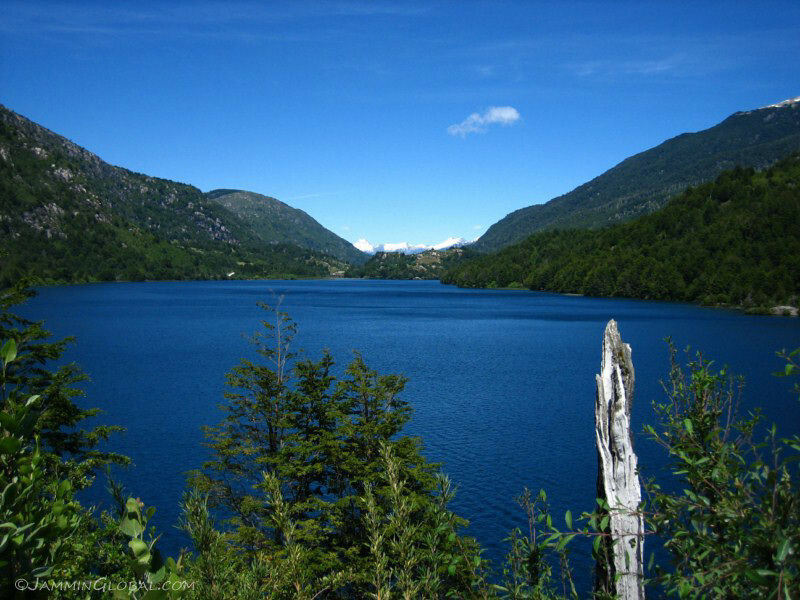 As the route gets close to its first encounter with ocean waters, I passed by the thin, long Lago Risopatrón. The road was cut into the cliffs and the views were wonderful while standing on the pegs. 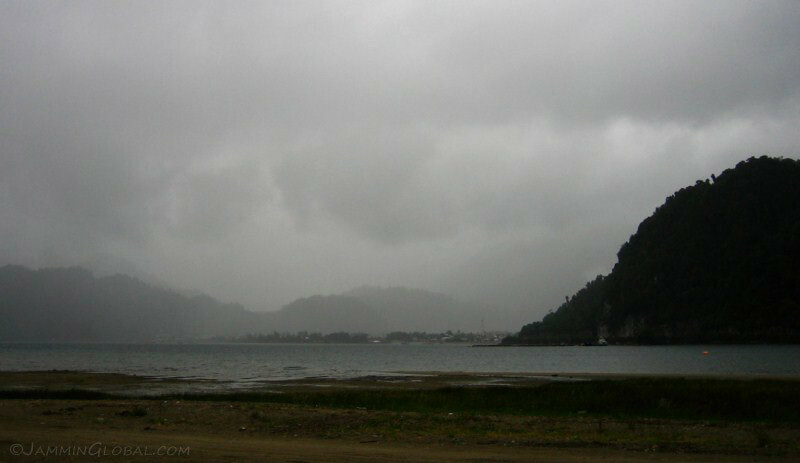 Coming up to the small fishing village of Puyuhuapi at the mouth of the fjord of the same name. It was settled by German immigrants in 1935 and its tourism potential is growing. You can see the route continuing along the left side. It was getting quite late in the day, but the bonus of riding near dusk is the beautiful light at this time of day. Local time was 7:30 pm. The sunlight hidden behind clouds brought a warmth that is easy to capture. 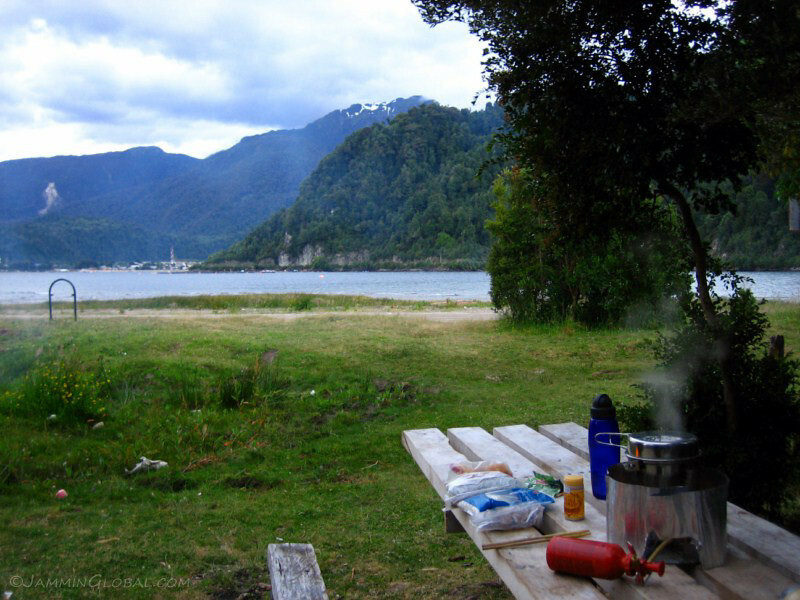 We set up camp at Parque Nacional Queulat, just off the main route and we didn’t have to pay any entrance fees since it was so late in the day. This is the glaciated river flowing from Ventisquero Colgante (colgante glacier) back up behind this ridge. 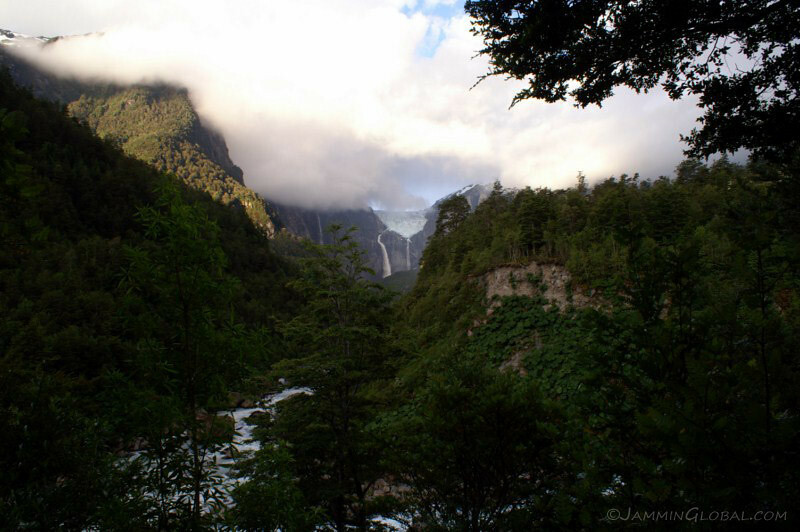 A panorama of the park giving you a glimpse of Ventisquero Colgante, a hanging glacier, up in the mountains there. 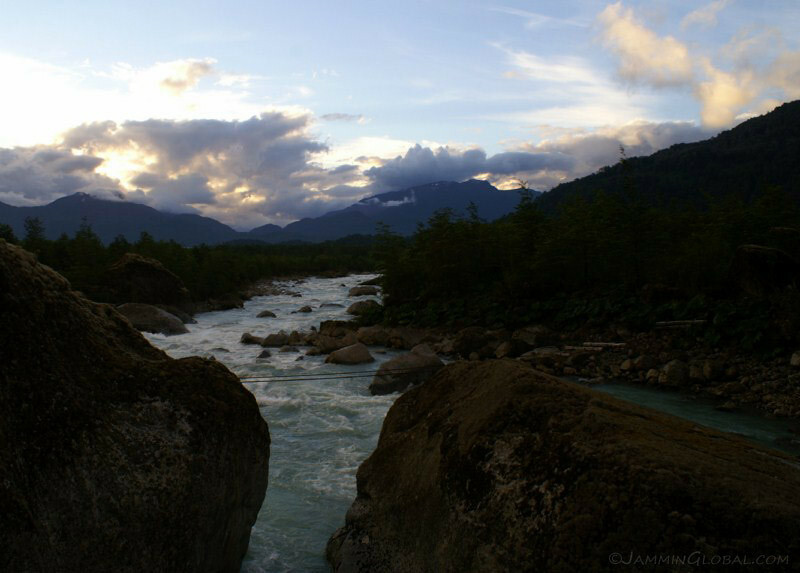 The river was full of huge boulders, all brought down from the immense force of the mineral-rich water. 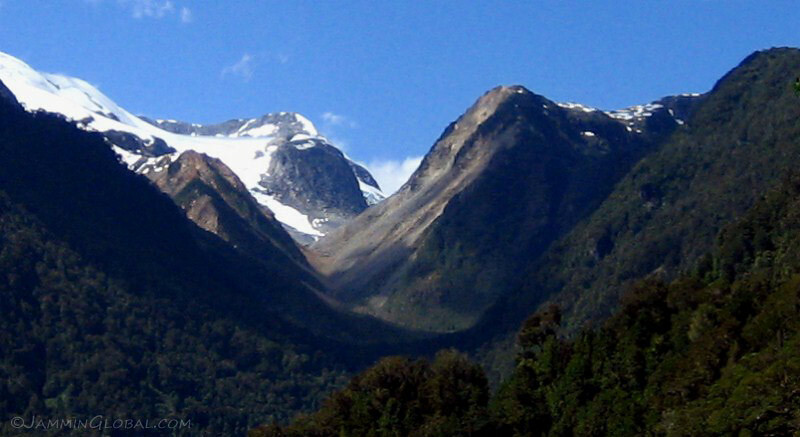 The next morning, we set off for a 2 hour hike to get much closer to the glacier. 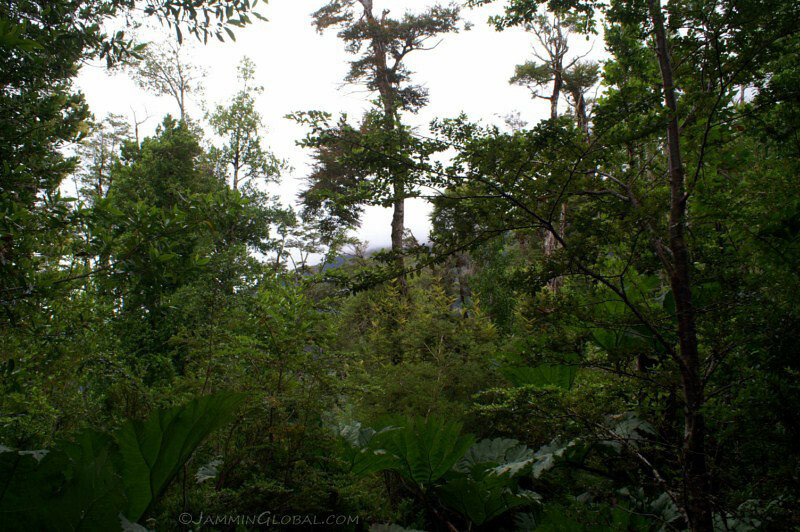 The trail went through wet forest that was full of lively plants. 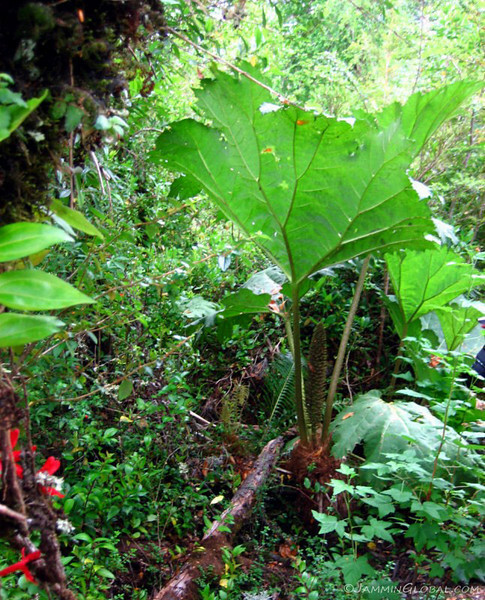 This huge-leafed Nalca plant is typical of the region and Francisco said the stalk is a delicacy, tasting similar to rhubarb. 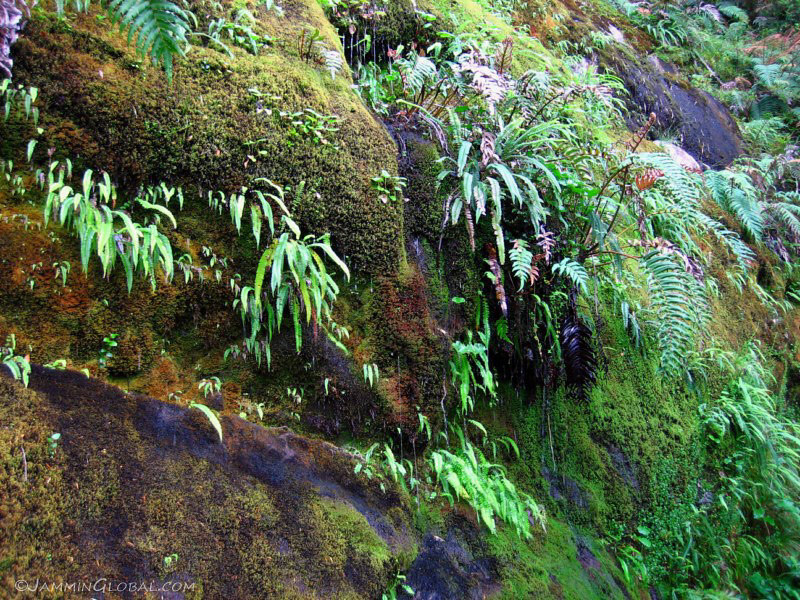 A weeping wall – water soaking down the rock face and allowing moss to flourish. We got to the view point by mid-morning and there was still cloud cover over the top of the ridge and hiding the glacier, so we waited for the sun to warm up the air. 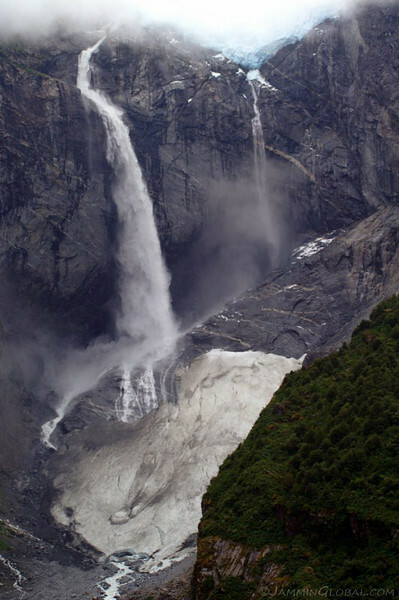 The glacier is constantly melting and its huge waterfalls is transporting that age old locked-up fresh water down the mountains and in turn, eroding the land. 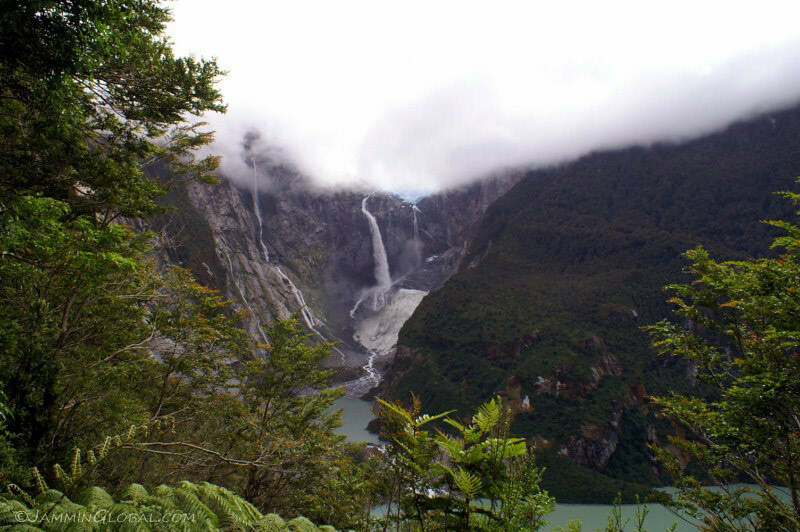 The waterfalls has a height of around 500 m (1,640 ft) and in the time that we were there we saw a new waterfalls form and disappear after a while. 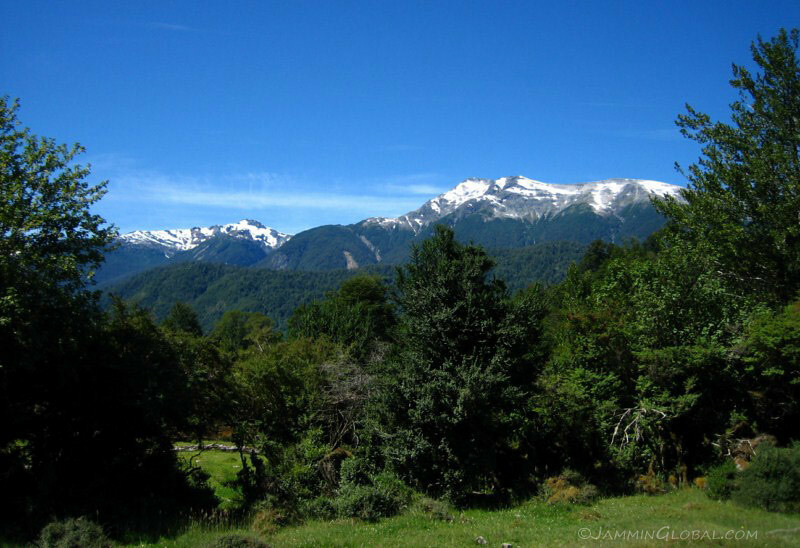 After giving it an hour, the clouds lifted and revealed Ventisquero Colgante in all its majesty. It was a sight to behold; a river of ice hanging in a high valley and the color of the ice, a vivid blue showing the purity of the water held in there. 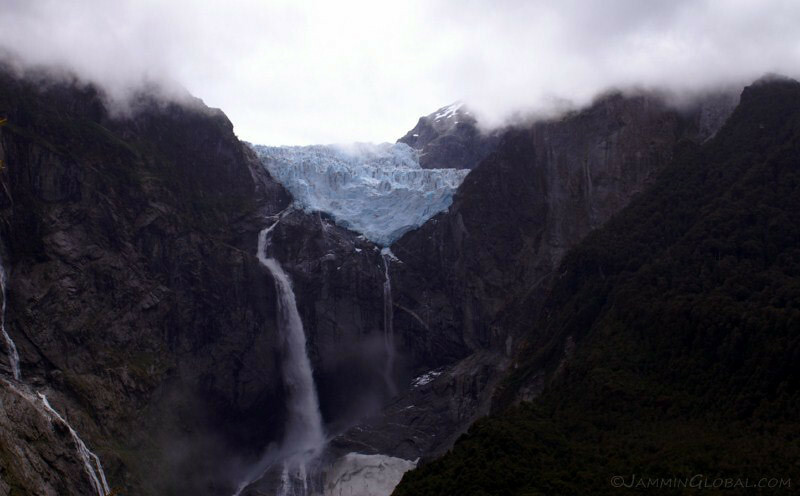 There were frequent loud cracks that reverberated through the valley as the glacier slowly retreated, back to its mother, an ice field in the mountains. On the way back down, a view looking west towards the route as it runs along the shoreline of this fjord. 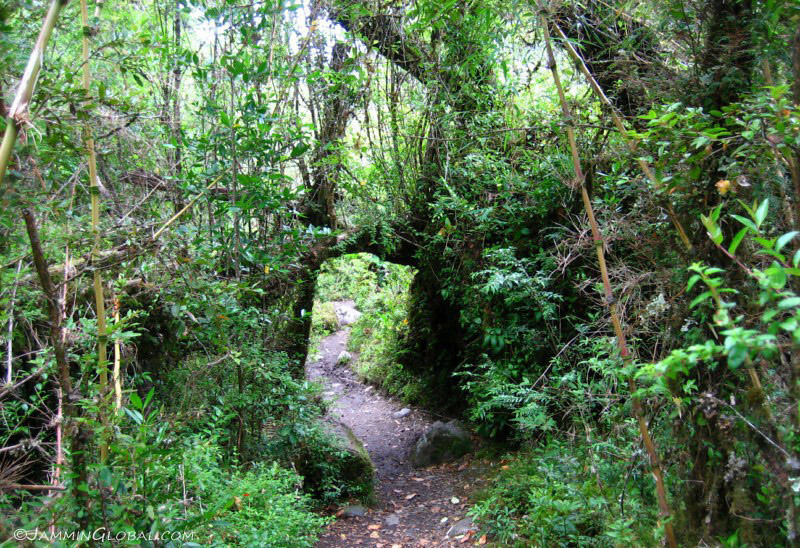 A natural arch on the trail from fallen trees. 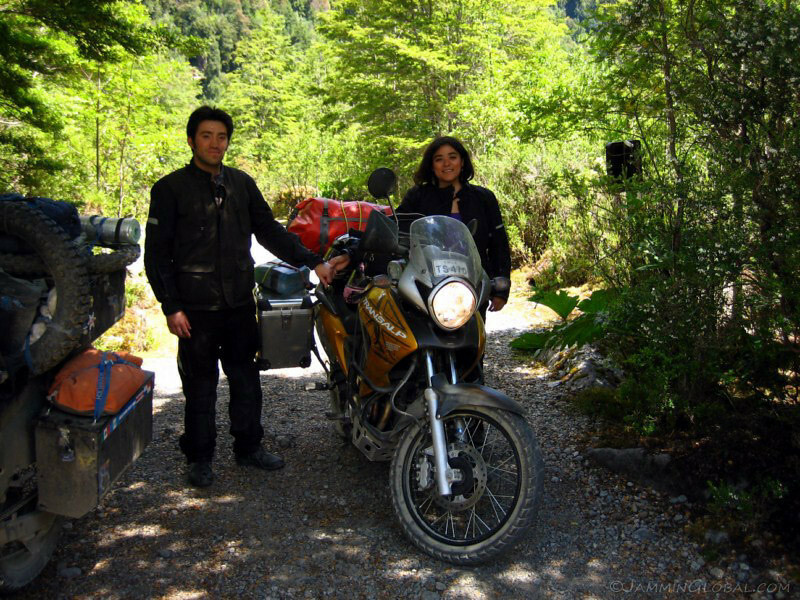 Saying goodbye to Francisco and Liz on their new Honda TransAlp, who set off from Santiago for a three week trip to the south, their first big motorcycle trip. Francisco was mining me for all sorts of various information regarding what tools were needed, how best to carry food and electronics, etc. I remember doing this to other travellers when I, myself was in the initial stages and it felt good to pass on this knowledge. They’re saving up for a house next and then the big trip to Alaska in a few years. Long term planning makes long term travelling a breeze. Setting off southeast back on the Carretera Austral, running along this fjord. When the route gets narrow, it raises your awareness as the surroundings close in. The huge leaves of Nalca plants added a new dimension to the scenery. 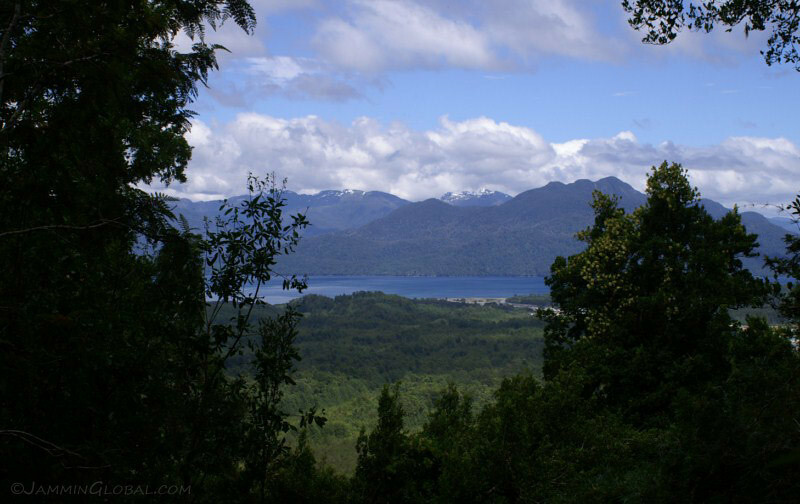 Between Puyuhuapi and the turn-off to Puerto Cisnes, the route is the most twisted as it climbs up and over a mountain ridge that extends to the sea. Gaining elevation quickly through continuous switch-backs. A pretty back drop as the route reached the summit. As I got more level with the peaks, I could see that they were all connected to an ice field extending over their tops. [URL=”http://jammin.smugmug.com/South-America/11-01-03-Patagonia/Patagonia0569pHR/1228905845_4ksBw-X3.jpg”]Click here[/URL] to see the high resolution version. A close up of a steep valley carved up by the flow and ebb of these rivers of ice. If we can transcend the business of our daily lives, the drama of Nature can be revealed. Yes, it’s hard to imagine this drama as it happens on time scales much larger than our few decades on this planet, but once awareness is raised of geologic time, stemming from the much larger cosmic time, there’s a hectic story being played out around our human civilization. It was hard to pay attention to the road as new snow peaks came into view and my search to see if they were revealed to be part of yet another mountain glacier or not. 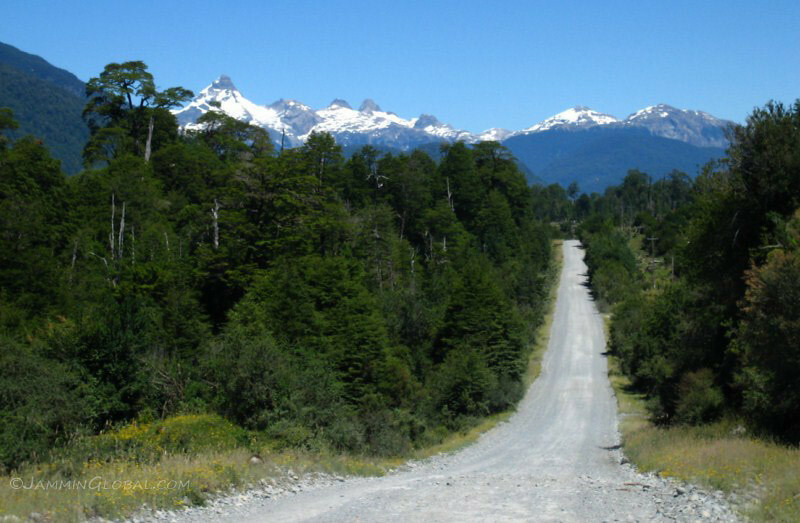 Tall trees and snow-capped mountains define this section of the route. 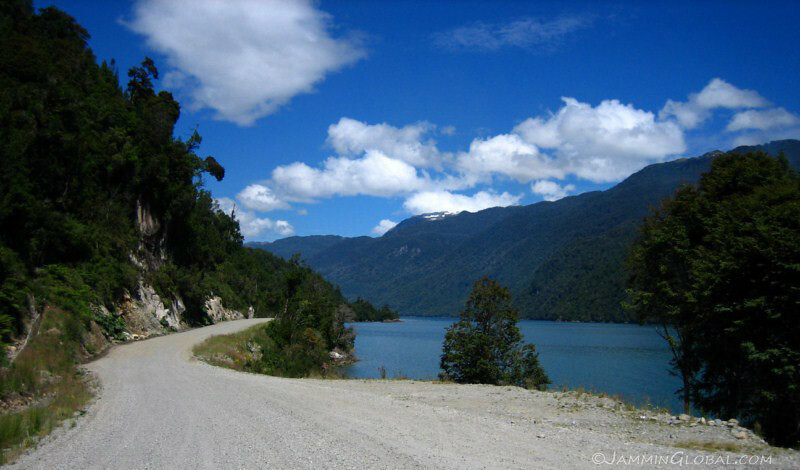 Coming down from the mountain, the first branch off of the Carretera Austral takes you along this newly paved section to the fishing community of Puerto Cisnes, about 30 kms (19 mi) away. 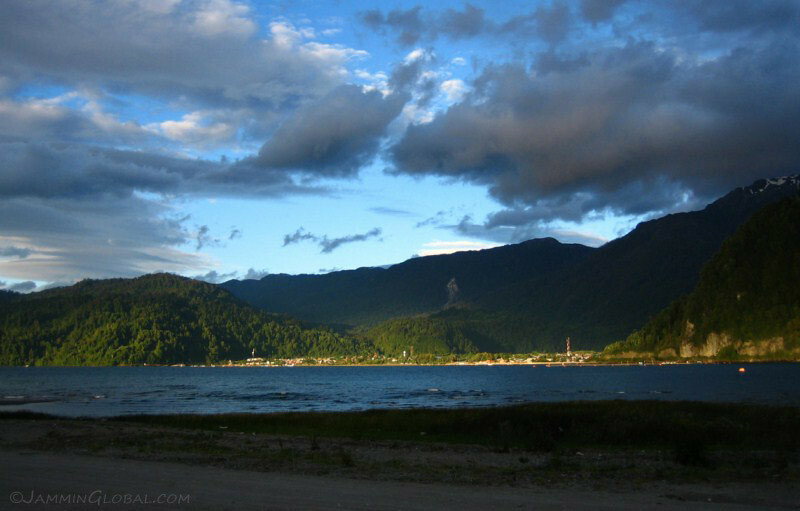 Puerto Cisnes at the mouth of the Puyuhuapi Canal. 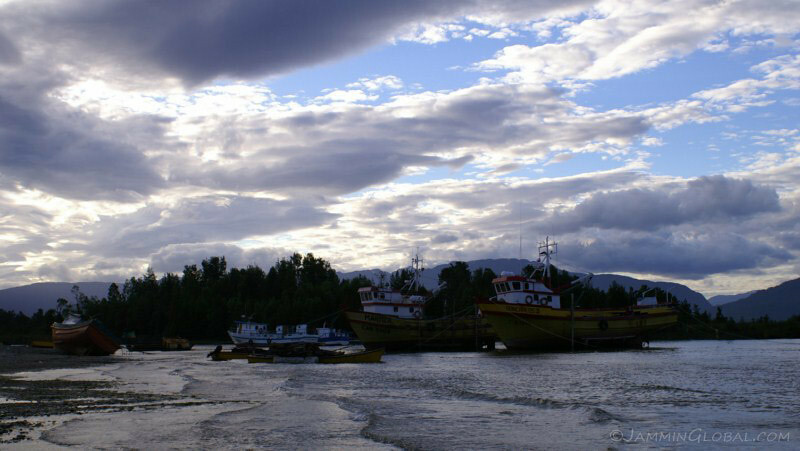 It’s a small town with fishing still the primary activity and all supplies are still brought in by weekly truck deliveries on ferries from Puerto Montt. 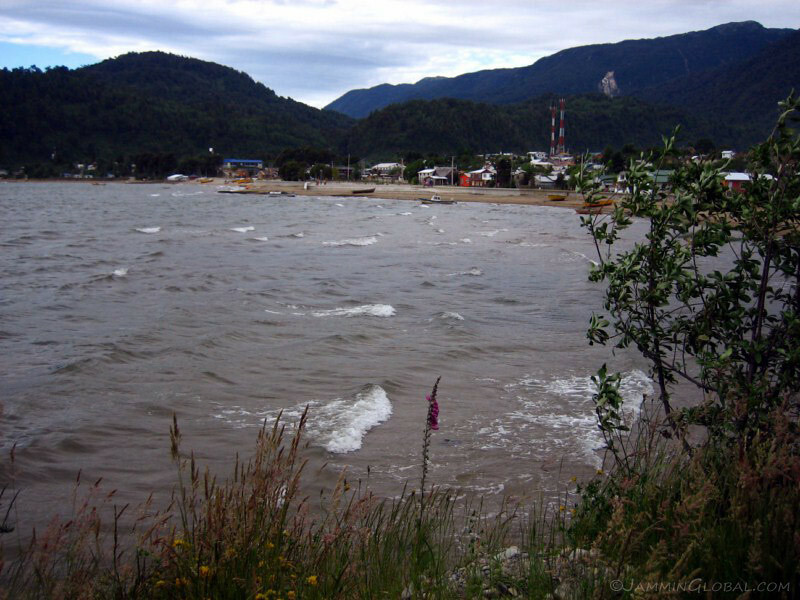 Even though the town has been recently connected via road to the Carretera Austral, commercial traffic is low on the route since it’s not easily connected to Puerto Montt. Across from town, I came across the municipal park that had picnic benches and places for barbeques and camp fires. I saw lots of dried wood lying around and collected remains from the other fire rings to have enough fuel to burn for the evening. 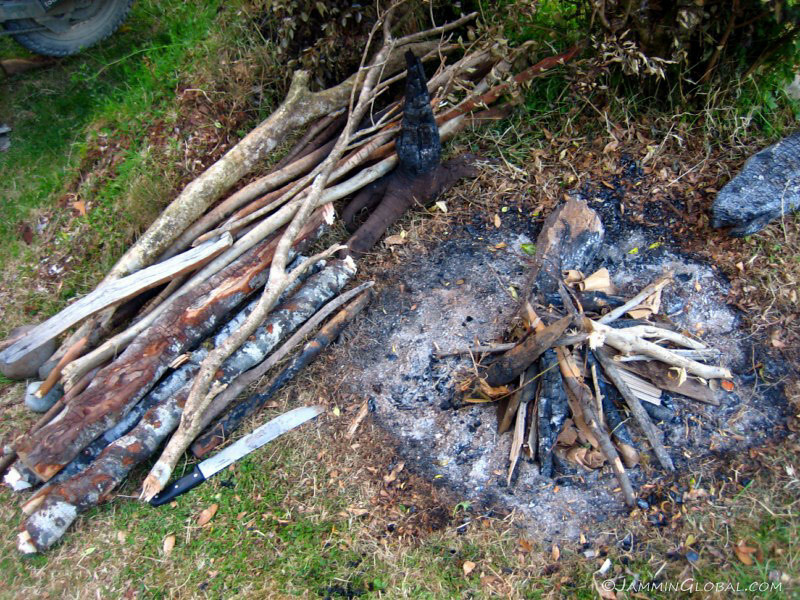 I finally put my machete to use by chopping up a dried tree trunk into burnable pieces. If you’re wondering, I’ve crossed numerous borders with this machete with no problems, cause no authorities have seen it. I bought it back in Bolivia, a few months ago before I headed across the Amazon and sleep with it by my side when I’m wild camping. The park was on the shores of this bay with fishing boats docked in the shallow waters. I watched as the waters retreated with the out-going tide. Local time is around 8:30 pm. 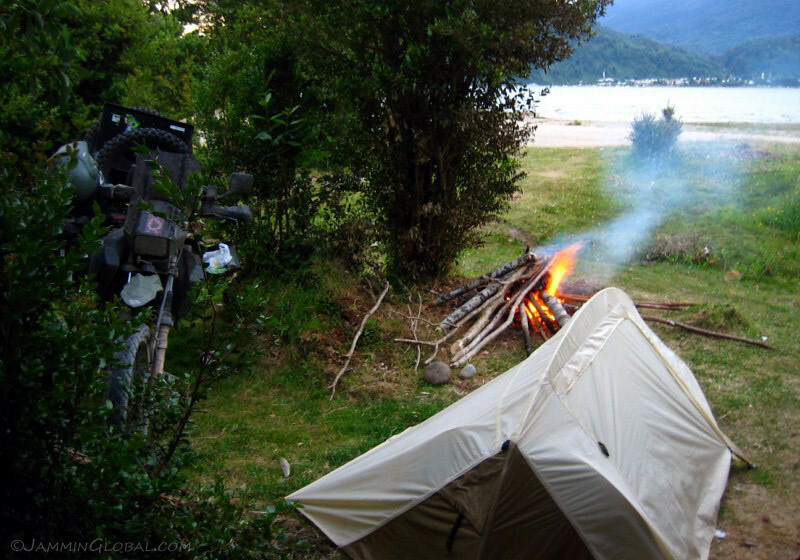 A lovely home with sanDRina parked among some trees and a roaring fire along a deserted beach in Patagonia. 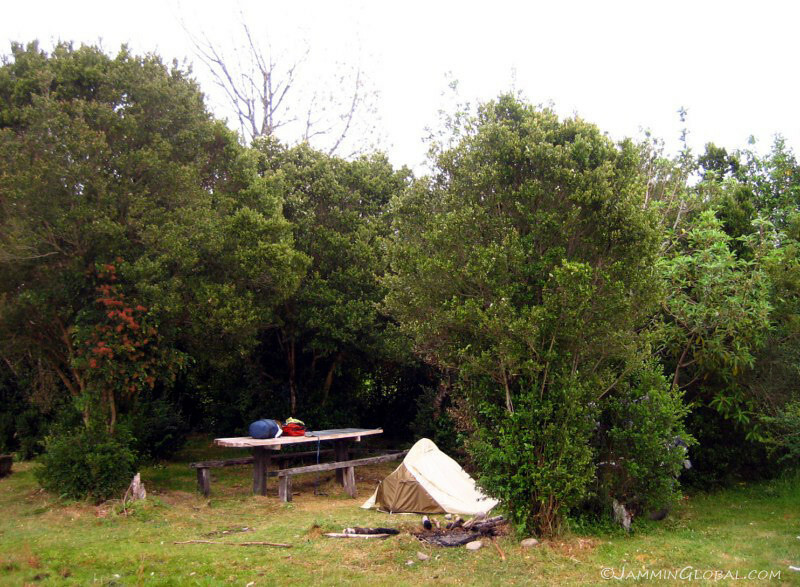 A picnic table isn’t essential, but it makes camping all the more comfortable as a place to cook food and roll everything back up in the morning. 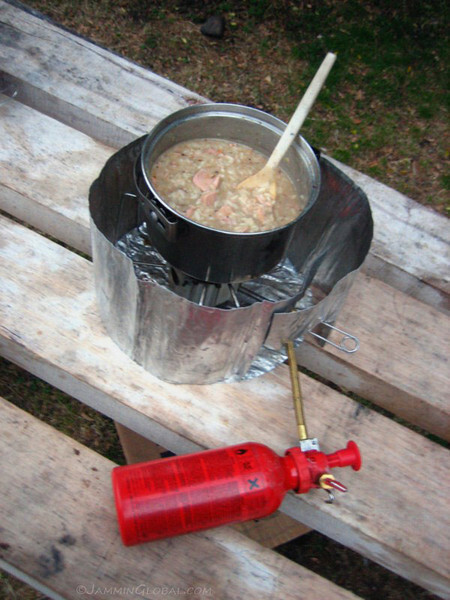 Cooking up some rice in a vegetable soup with tuna chunks on the strong performing MSR Dragonfly stove. Other travellers told me that using petrol as a fuel would require constant maintenance of the burning jet as it’s a dirtier fuel than propane, but so far, so good. Frying up some crispy salted chillies, made by my aunt in her village outside Madras, India. The red chillies are soaked in salty curd (plain yoghurt) and then sun-dried. Deep-frying them to a crisp makes for a tasty condiment that’s not too spicy. 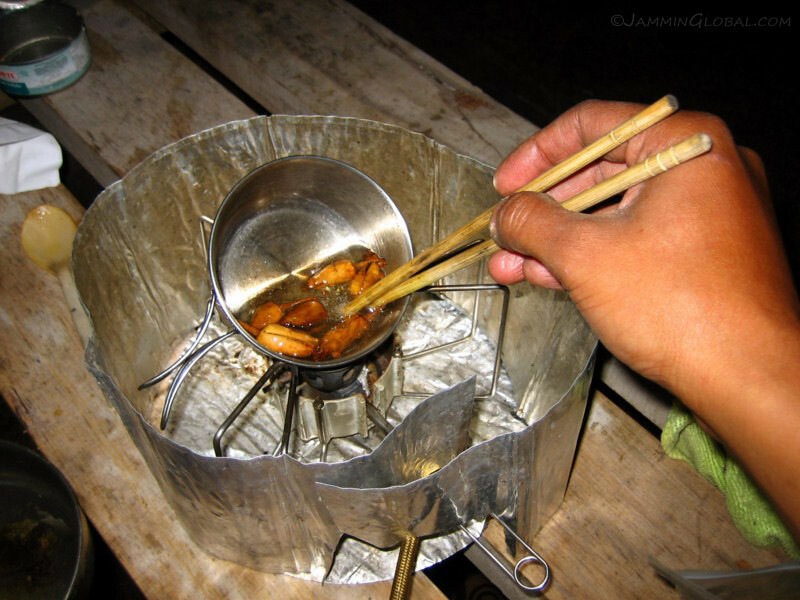 I’ve tilted my smallest pot on the stove in order to use the least amount of oil possible and handy chopsticks getting the job done. There’s an intricate global supply chain in place in order to get these homemade goodies all the way from a village in India to my panniers in South America, thanks to my sister who’s been my logistical coordinator. 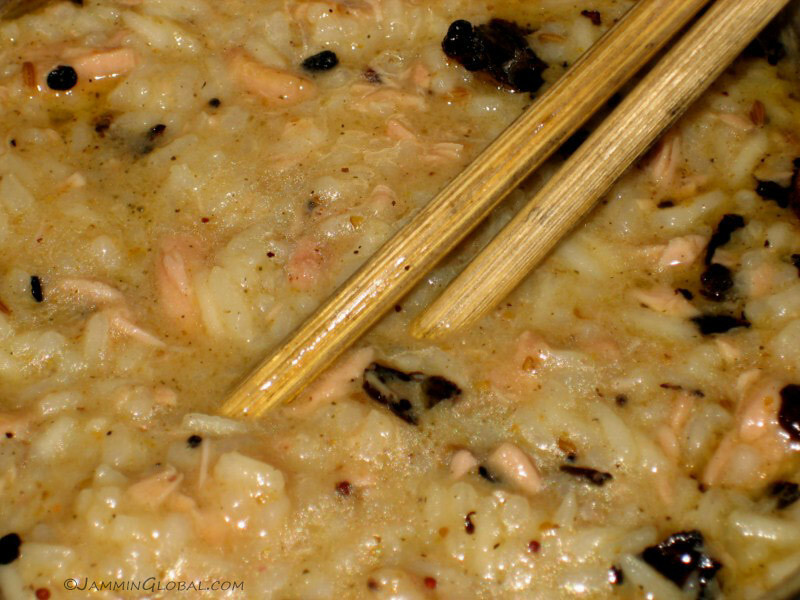 And voila, a tasty rice dish with some hearty proteins. After frying the chillies, some bits got broken off and the seeds also remained in the oil, so not to waste a good thing, I dumped the oil in the rice to heighten its flavour. My saturated fat intake is pretty low while I’m camping, so I can afford this oily addition to my diet. 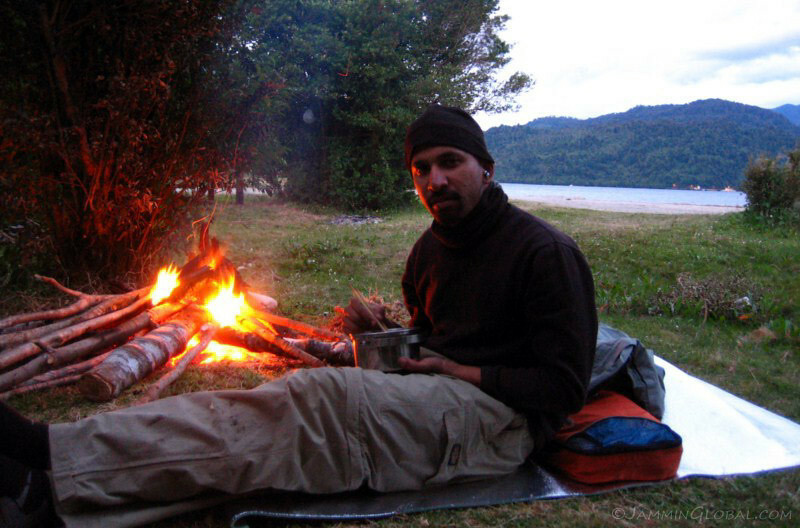 Enjoying a tasty meal by a warm fire in southern Chile. What more do we really need? After dinner, the simple entertainment of managing a fire makes up the evening programming. 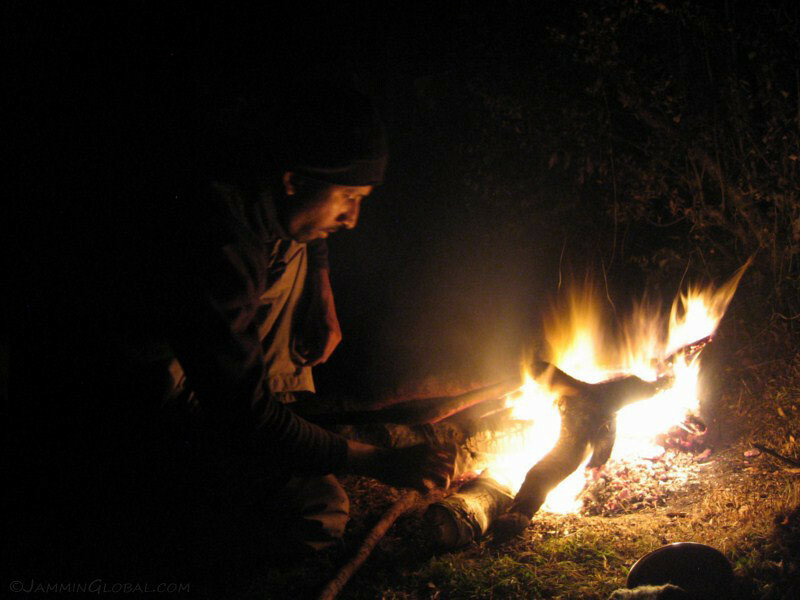 Once a fire gets going, it becomes an entity that responds to inputs that can massage the required carbon out into the oxygenated atmosphere, releasing light across its spectrum from visible to infrared (heat) along with the products of this combustion being CO2. Contributing to the ever-increasing amount of CO2 in our atmosphere does give me second thoughts about lighting a fire. However, I’ve eased my worries by calculating my carbon footprint for this trip and seeing that with an average monthly mileage of 4,750 kms (2,950 mi) on a motorcycle, my carbon emissions come out to 0.52 metric tons of CO2, compared to the monthly average of a developed urban resident being around 15 metric tons. So, a camp fire here and there feels justified. I woke up to rain the next morning, which is very common here, hence all the lush vegetation. I had to wait it out in the tent until it let up before I could emerge and go about the business of packing up a wet tent. Since mainly the outer tarp gets wet, I had it strapped on top of a pannier, along with the wet bike cover. It’s pretty slow-going in the morning when I camp and I just take my time, which I’ve observed to be 3 hours from the moment of waking up to rolling away on the bike. 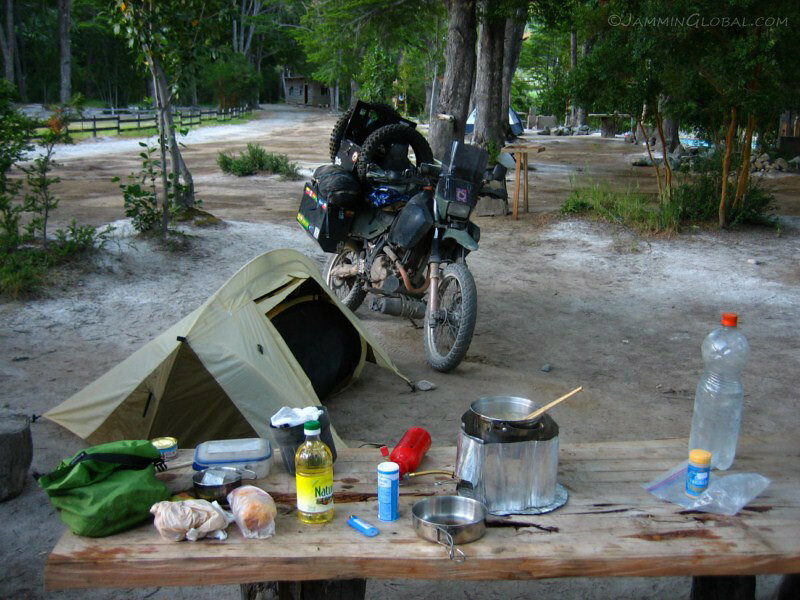 That takes care of washing up, preparing breakfast, washing the pots, packing the sleeping equipment, the off-bike clothes and putting everything back in its set place on the bike. 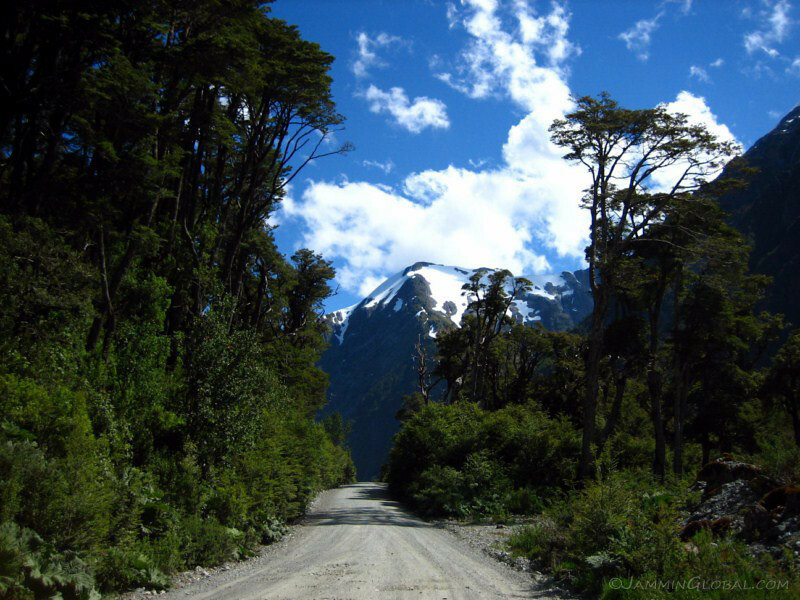 Heading back to the Carretera Austral. 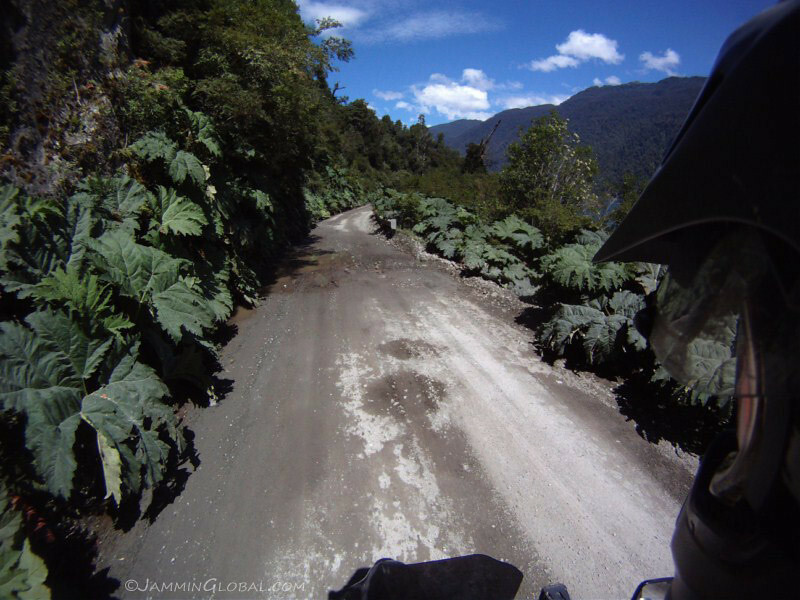 The road to Puerto Cisnes was only paved halfway. A scenic sight of Rio Cisnes with boulders brought down from the mountains. 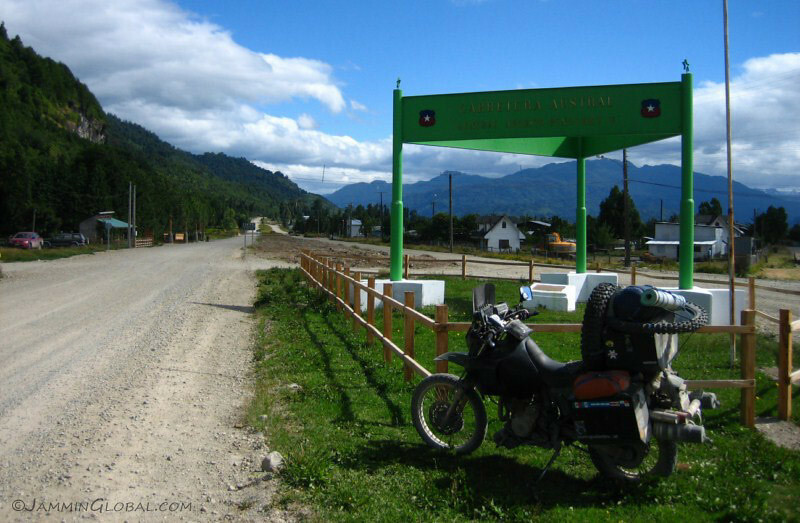 Back on the main route, which is paved for the next 270 kms (168 mi) past the big city of Coyhaique. Climbing up and over a ridge with a wide view of Rio Cisnes down in the valley. 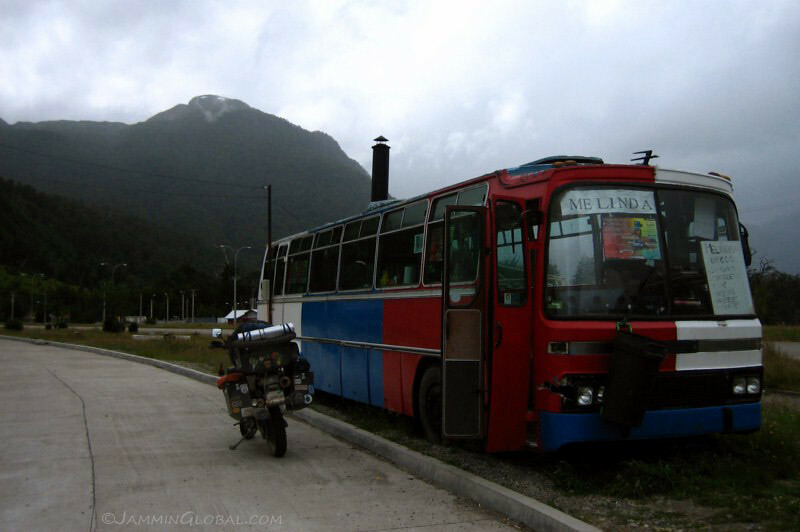 As I was passing by the pioneer village of Villa Mañihuales, I noticed this bus with a chimney on top and stopped for a light lunch. 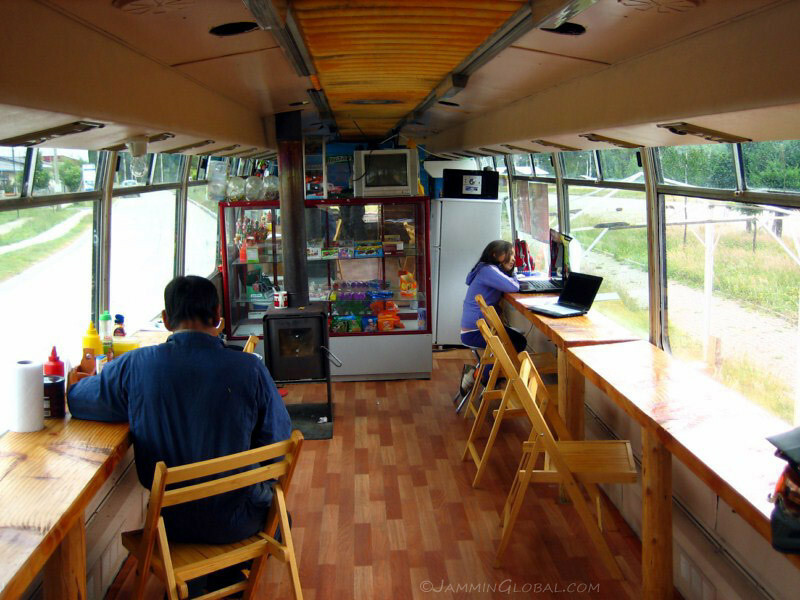 Melinda’s Cafe is quite snazzy for how remote it is and I was happy to find wifi on this grounded bus. Since I had only a short ways left to my destination tonight, I bought a sandwich and spent an hour catching up with my digital life. Back on the road and the impressive views are relentless. There was about a 20 km (12 mi) section of gravel that was under construction near this bridge. 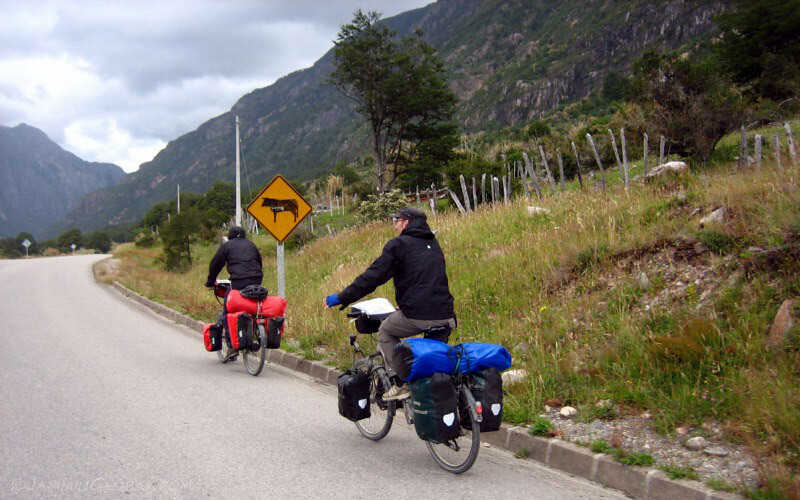 The Carretera Austral is hugely popular with touring cyclists. I saw more of them than motorcyclists. I’m moving so slowly that I kept passing these two guys every day. But hey, it’s not a race. There’s a story behind this picture: Yesterday, when I stopped to take a photo of some snow-capped mountains with my SLR, I dropped one of my Wunderlich luggage straps and didn’t notice it till the next stop and I went back to look for it to no avail. I passed Helmut here and since they’re obviously going much slower and can see more of the road, I asked him if had seen the strap. So, today when I passed him, he waved me down and said he had found my strap. How nice of him and being German, he understood the importance of quality German-made luggage straps. 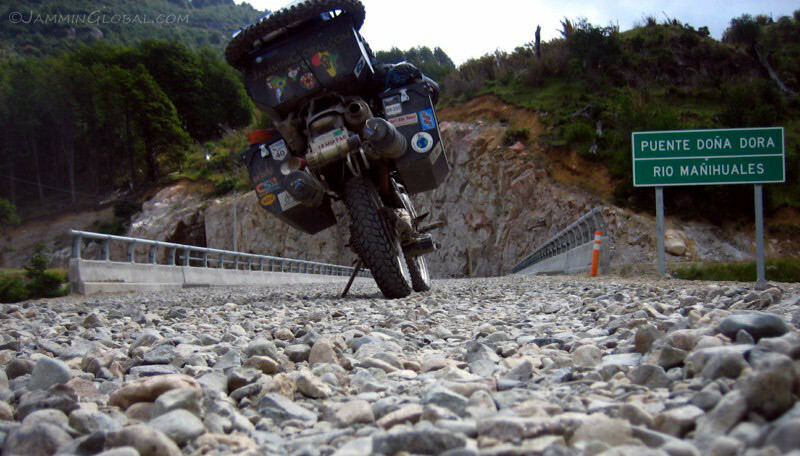 Fostering good relations between motorcyclists and bicyclists. 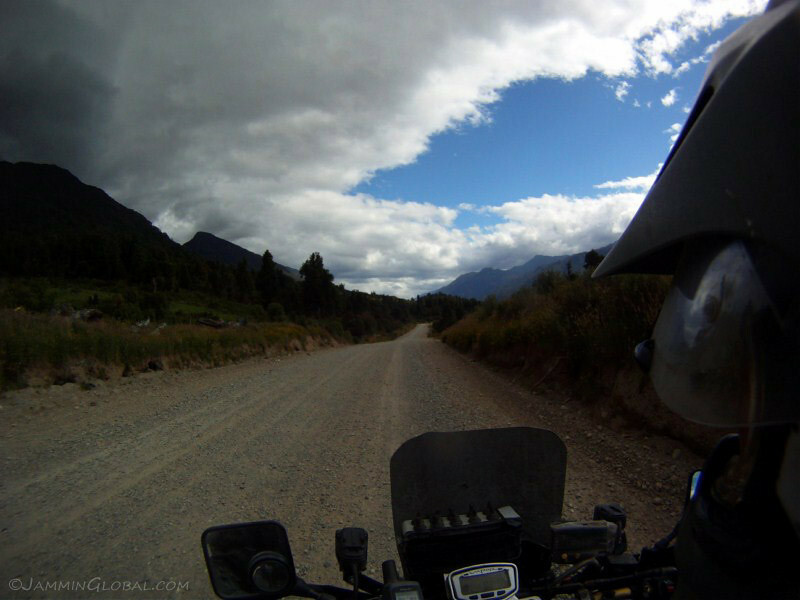 As I rode thru Valle Río Mañihuales, the skies opened up and let loose their rain, so I found a comfy hotel in Puerto Aisén for CP12,000 ($24), ouch, but I didn’t want to set up camp in the rain and a warm shower sounded good after three days. What outstanding vistas, mile after mile. Wow! I can’t even begin to imagine what it must’ve been like. Oh, and the glacier was beautiful!